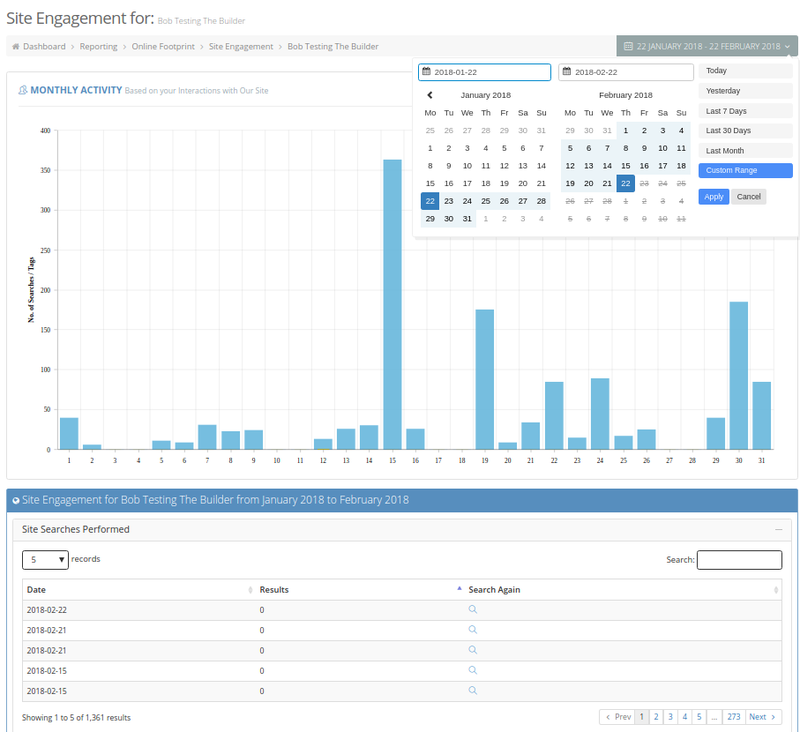 Company Usage also referred to as a Usage Report is located on the Dashboard menu on the left hand side under Reporting. When clicking on Company Usage the following page will appear. 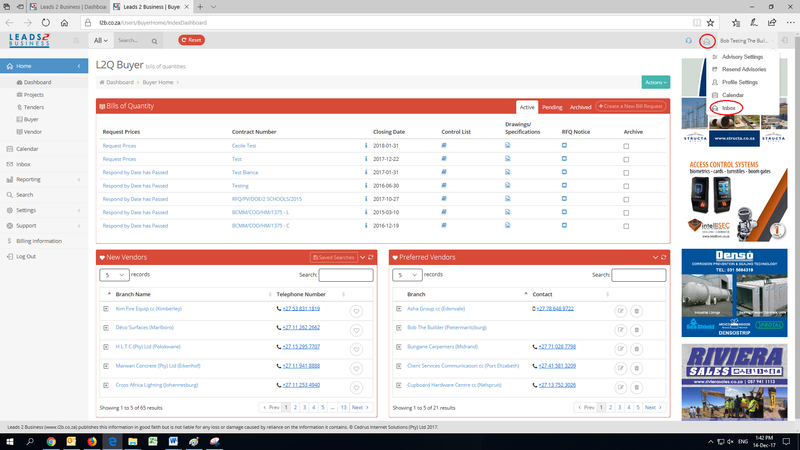 If you click on Company, Division, Branches, Contacts the heading’s will be highlighted and the drop down will be highlighted and the section expanded. 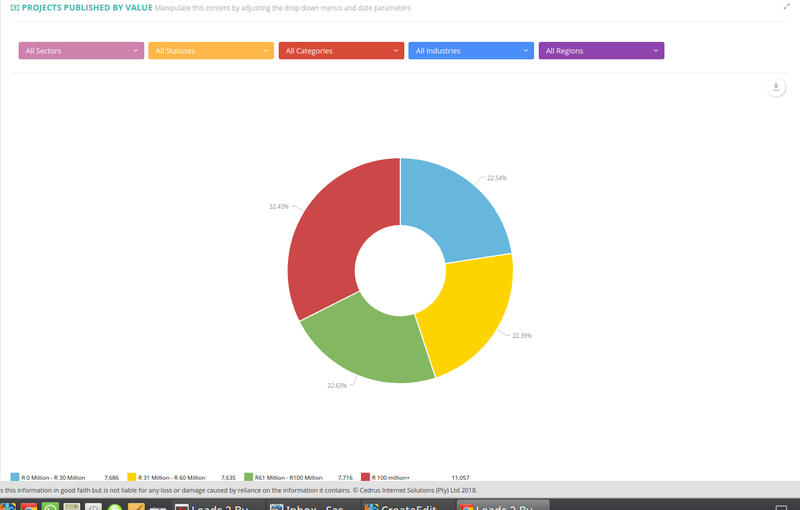 You are able to click on each level to view the usage reports as well as each contact. On each level you will see links which indicate you can click on these links to view that specific Contacts Usage Report. 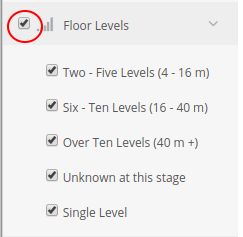 By selecting the various options under Floor Levels you can filter your search by either Two, Six, Over Ten, Unknown or Single Levels. Save .csv file to your computer. 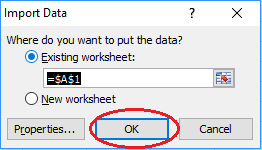 Open a blank Excel workbook. Navigate to the Data Tab. 4. On the ribbon choose “From Text/CSV”. 5. Browse for .csv file and click on “Import”. 6. 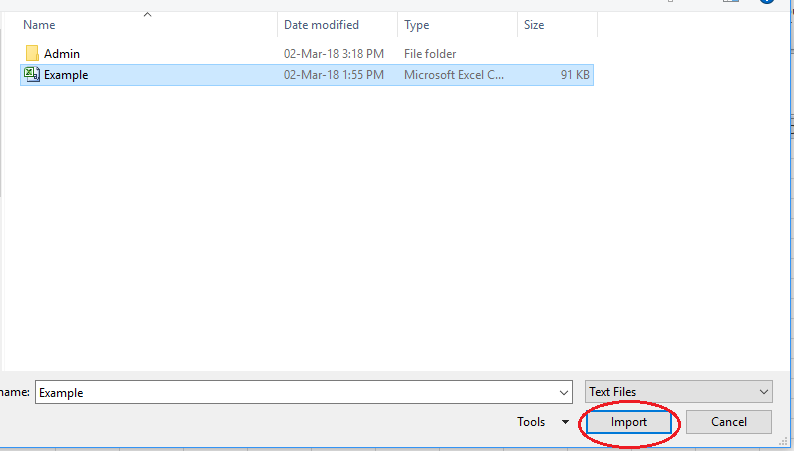 The Text Import Wizard will open. 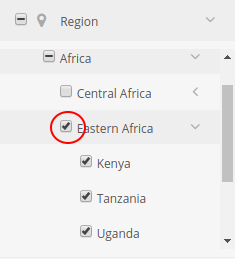 Select “Delimited” and click “Next”. 7. On the next screen, remove the tick next to “Tab” and tick next to “Comma”, then click on “Next”. 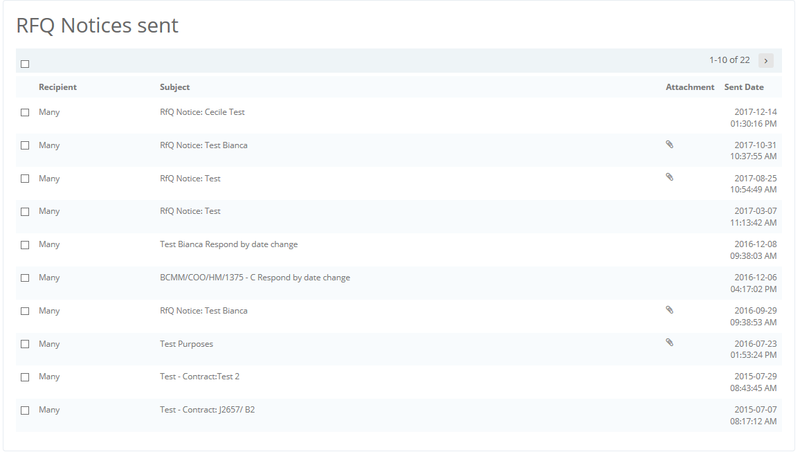 You will see that once you have ticked next to “Comma”, the data will display in columns, as per the “Data Preview”. 8. On the last screen, click on “Finish” and then “Ok” on the “Import Data” pop-up. 9. The data will then be displayed in the applicable columns and the file can be saved according to the user’s preference. Please note: Different versions of Microsoft Excel might have different steps to the above explanation, for assistance, please contact the Leads 2 Quotes Department on 087 150 1465. This icon links back to the above explanation. 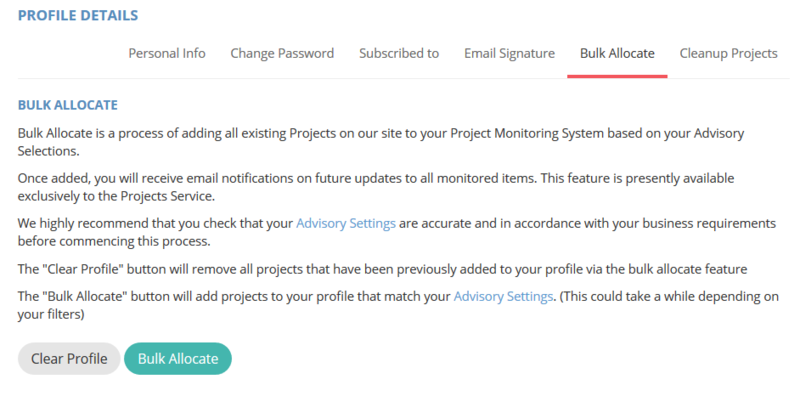 Bulk Allocating will select to monitor all Projects that fit into the filters that you have selected for your Daily Advisories. You will receive emails on all Projects that you are monitoring as soon as they are updated or changed in any way. Select ‘Upload Logo’, you will then select your company logo from your PC. Please note that you are only able to load Image Files. You may then update your email signature. Your email signature may only be text, it does not allow for images. Enter your current password in the first block, then enter your new password into the second and third blocks. Your password needs to be at least 6 characters long. 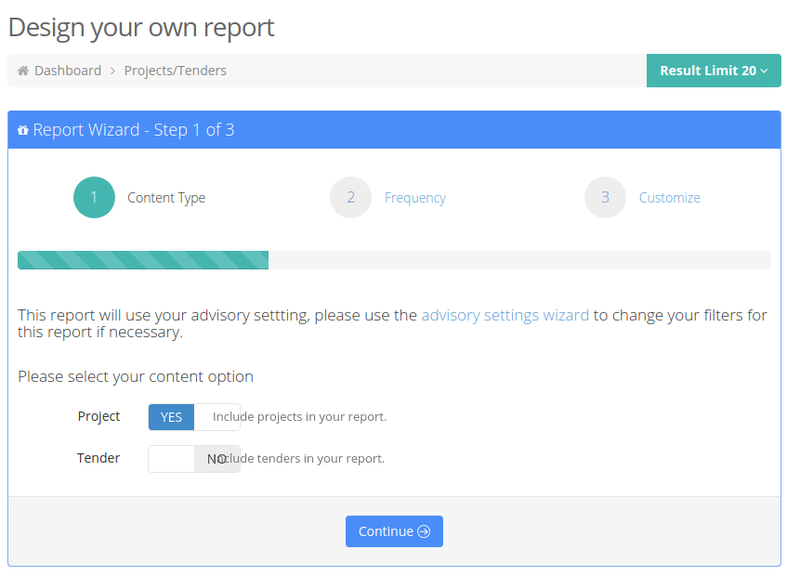 Send Me Updates (previously known as “Assigned to”) allows the Main User and/or Monitors to be assigned to the Project lead in order to receive updates/changes. 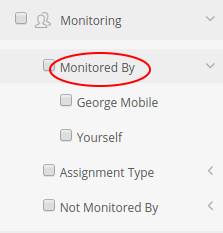 A pop up box will appear where you are able to select who is required to monitor the project, send a message (assignment note) and click on submit. The monitor will receive an email advising them that a project has been assigned to them with the information of the assignment note. 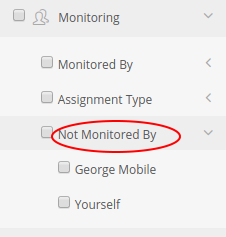 When the monitor opens the Project, the assignment note is reflected above the notes block where the monitor is able to make their own personal notes regarding the Project. Once own notes have been entered, click on save your note. 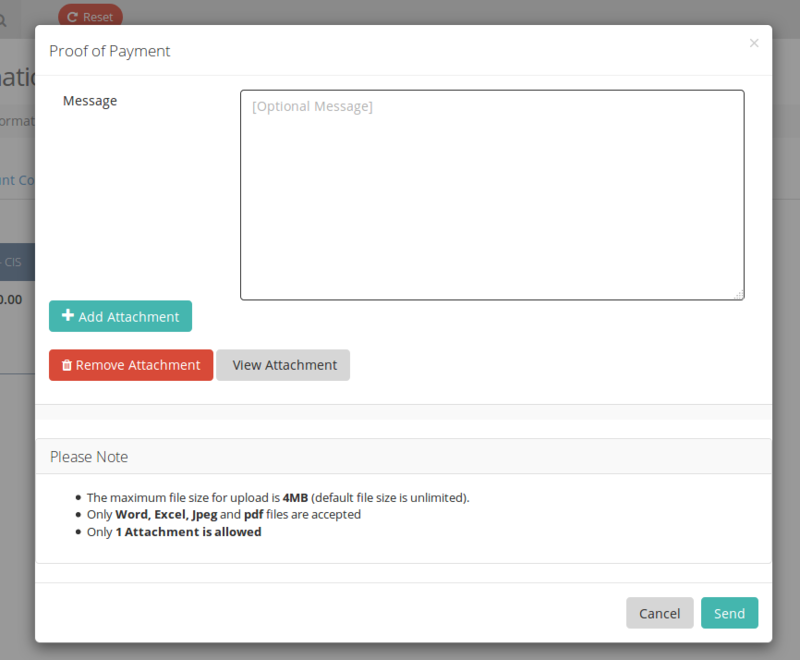 A notification will appear on the top of the screen to indicate an email has been sent to the main user. Do the required searches and once you have the result, please click on the reference of the Project to open the Project in another tab. 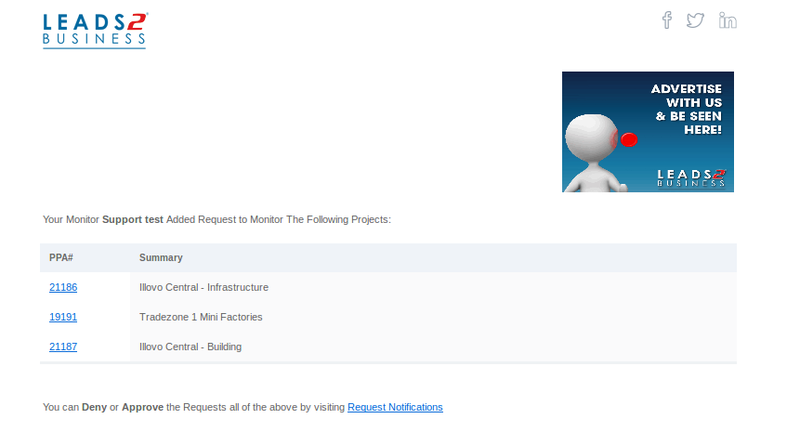 Click on the actions bar and select “Request to Monitor” and a request will be sent to the main user. 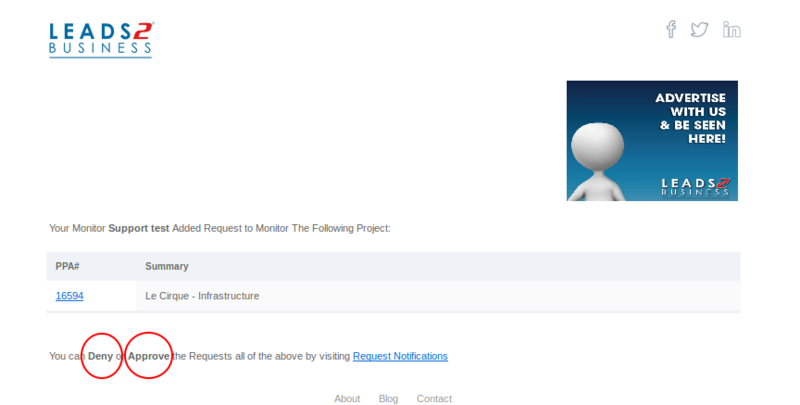 Once a monitor has requested to monitor or unmonitor a Project, the main user will receive an email indicating the monitors request. 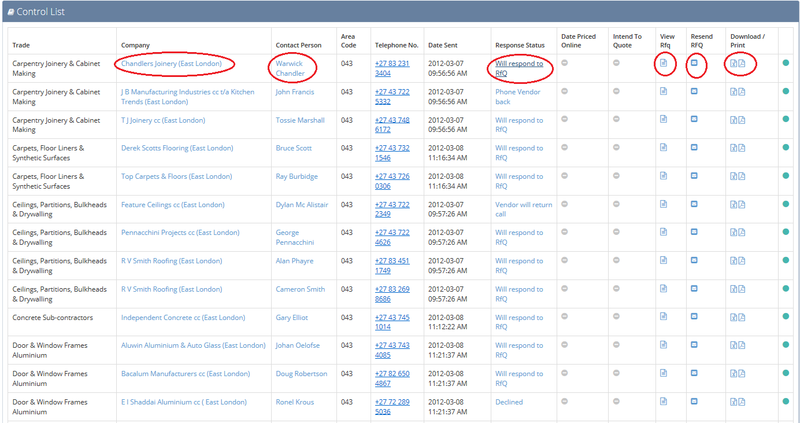 The subject line will indicate – Your Monitor (name) Added Request to Monitor The Following Project. The main user will select Deny or Approve. 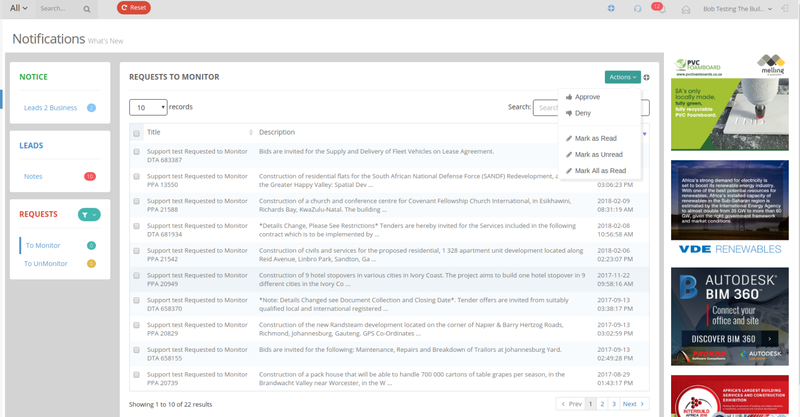 The “Calendar” is where you can view reminders that you have set for tenders and projects in a calendar format. You can view or edit your reminder by simply clicking on the DTA or PPA number shown above. You will then come to the page below, where you can either cancel the reminder, create a new reminder, view the tender that you have the reminder. As this reminder has passed you also can go to Historical to view the reminder if you wish you can re-instate the reminder for a different date. 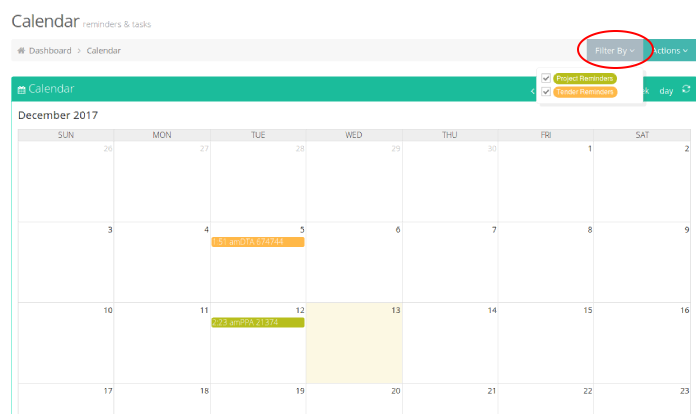 To view the “Calendar” as full screen click on either of 3 options below as indicated. 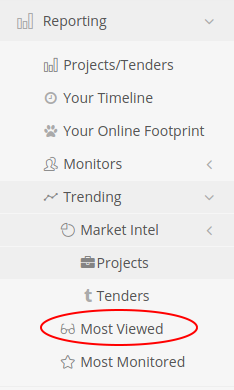 You will then view the Calendar as follows, you can select if you wish to view either Project or Tender Reminders only by clicking on “Filter By”, then select your option. 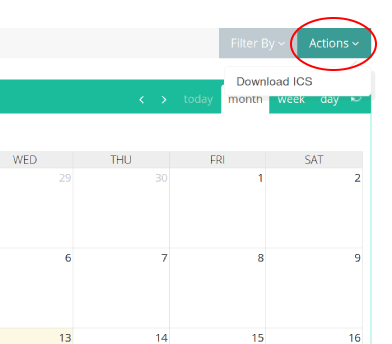 If you wish to Sync the Calendar with your Google calendar you click on Actions and Download ICS. Please ensure that all your contact details are correct. This is vitally important to ensure that prospective clients are able to access your correct details on our site should need to. *NB* Please note that your email address is not listed on the site for others to see, they are only able to email you through the email link that appears on your Directory Listing. Here it is important to check that your “Branch Description”, “Branch Capacity”, “Serviceable Regions” and “Trades” are all listed correctly as these will determine which RFQ’s are sent to you by main contractors. 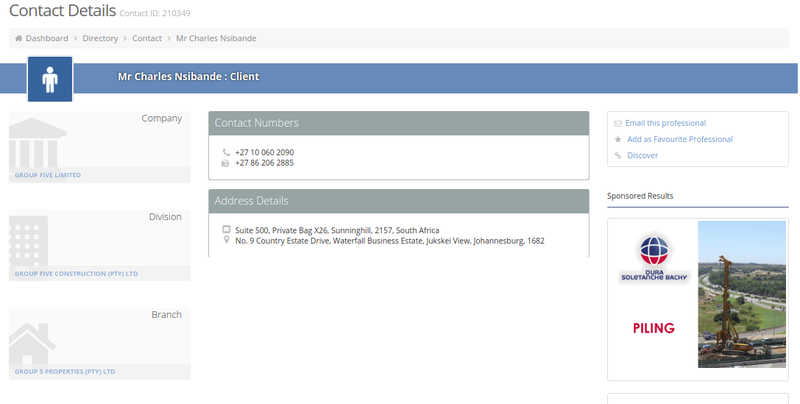 Also check your “Contacts” on the Left hand side of the page to confirm if the correct contacts from your branch are listed. 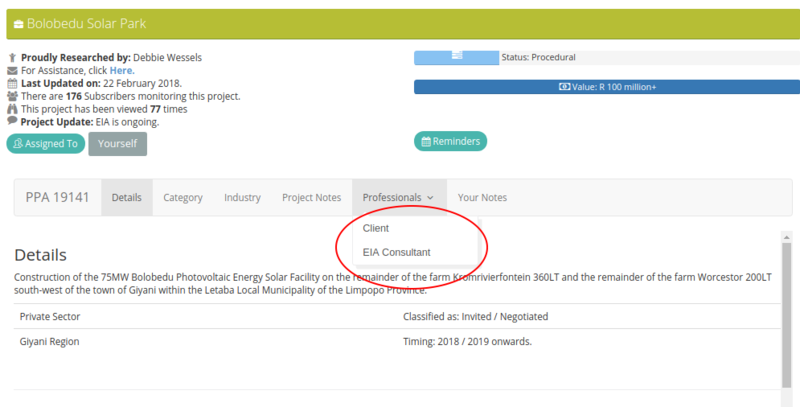 Please click where indicated and you will be able to download the tender documents made available on the organisation website. Should the above not be available, this means that either the tender documents are available in hardcopy for purchase and/ or collection only. Or at the time of the tender notice publication, the tender documents were not yet available for download. Pro Tip: When the closing date of the tender notice passes, this link will no longer be available. Once you have clicked on either of the above options the Notifications appear as a list. 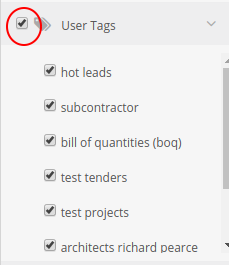 When clicking on each Lead it will open in order for you to read the full message where you can also click on the relevant hyperlink (in blue) which will open the relevant Tender/Project in a new tab which Note relates to. 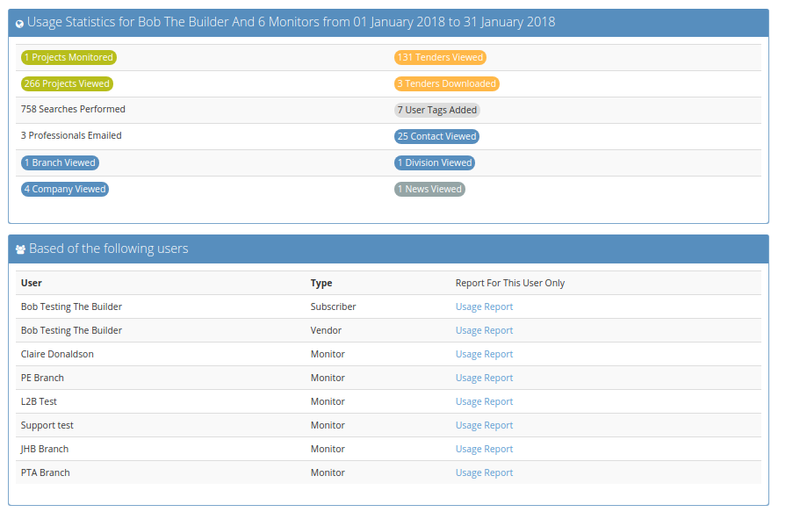 The Request to Monitor/Unmonitor can also be accessed via an e-mail and you are able to click on “Request Notifications” to redirect to the Notifications page. 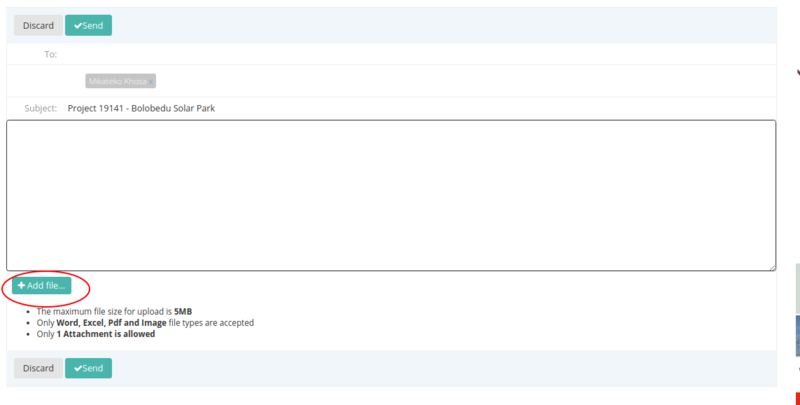 The requests can be “Approved” or “Denied” in bulk using the selection boxes and Actions bar. Enter your current password in the first block and then enter your new password in the second and third blocks. Your password needs to be at least 6 characters long. This is information pertaining to your Account with Leads 2 Business. 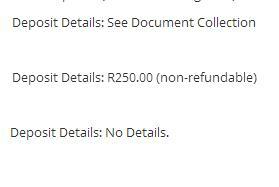 You can view the payment which is currently outstanding, under ‘Account’. Reflects your invoice for the current Financial Year. 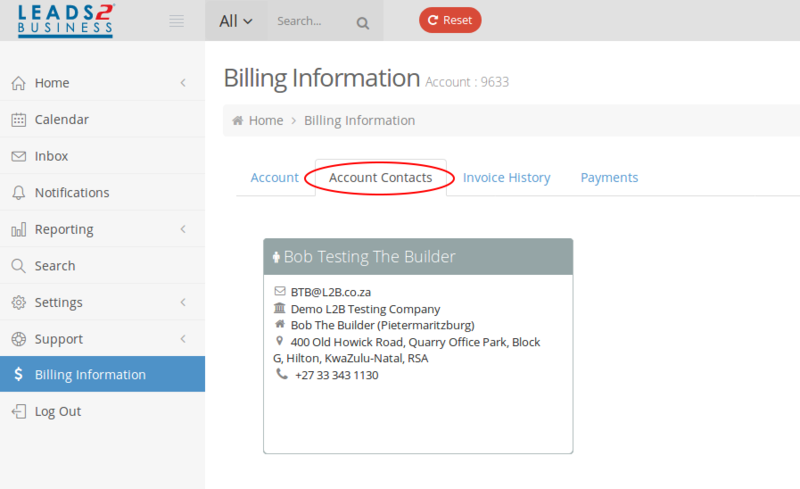 If you wish to view previous invoices please click on accounts@l2b.co.za or e-mail directly. Your payment history will reflect. 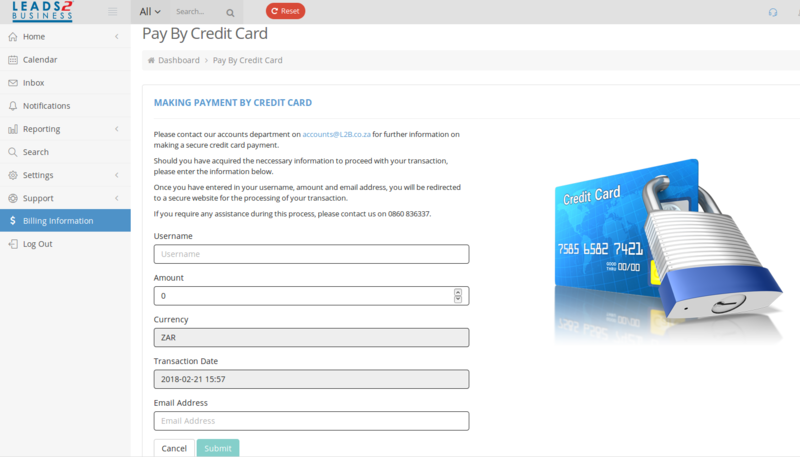 If you wish to make a credit card payment, simply click on ‘Actions’ and go to Pay Now. Once you click on ‘Pay Now’, you can through the steps to make your payment and select submit. If you wish to upload proof of payment once you have made your payment and send it through to our Accounts Department, complete the information below and then send. 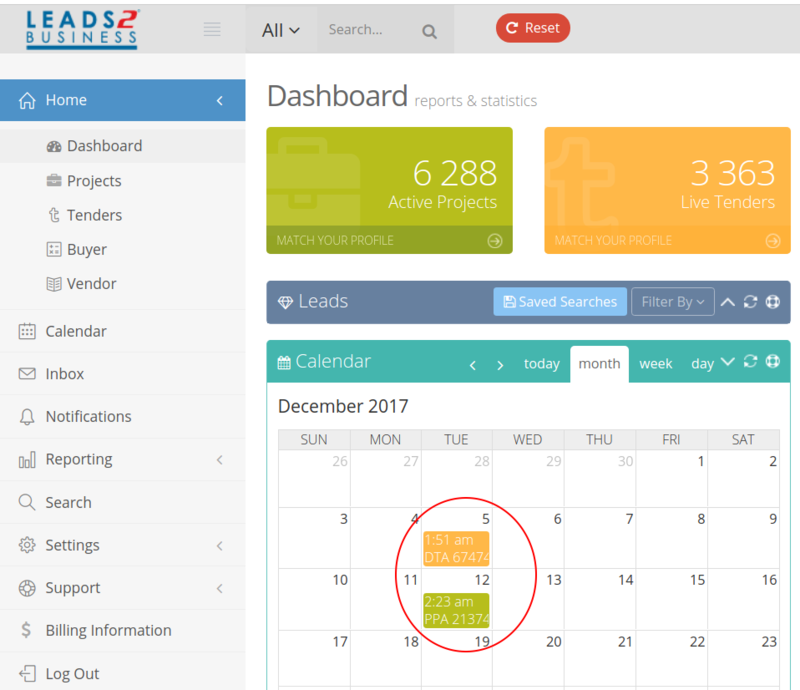 If you want to view all your leads from the Previous day, you can view the leads here with various options how to view the leads. If you would like to Monitor a Lead click on the following icon. You can monitor the lead yourself or allocate the lead to one of your monitors. If you want to “reload’ the leads click the following icon and it will reload the search with your changes and add new leads that have been added to the system from that day that match your profile. 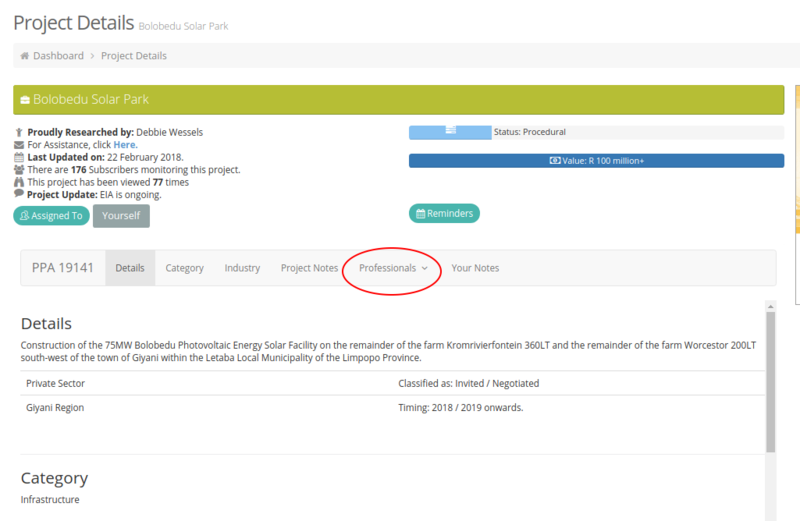 If you would like to search your Favourite Professionals, type in the name in the search block and it will automatically reflect. 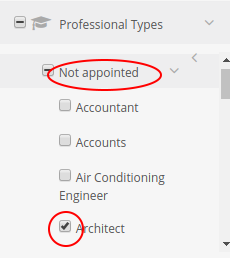 If you would like to view your Favourite Professionals in alphabetical order, either click on the arrow next to the Name or the Company Name. The “No” indicated below means that you have not e-mailed the favourite professional before. If you select the dustbin it allows you to remove this professional from being a Favourite Professional. Once the bill has been sent to your Vendors, a Buyer is able to communicate with their Vendors any changes, notification of additional drawings and/or addendums to the bill by sending out an RFQ Notice. 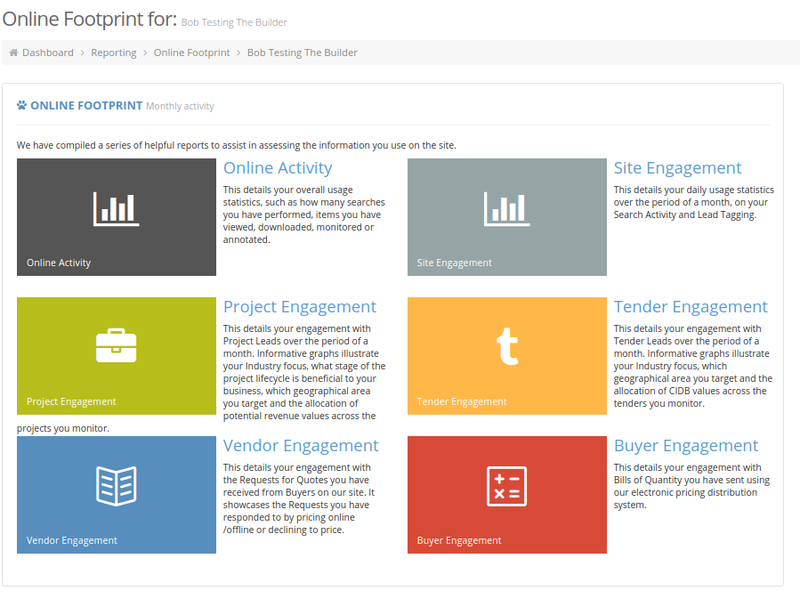 On the ‘Buyer Home’ page identify the relevant L2Q Project you wish to send the Notice out on. 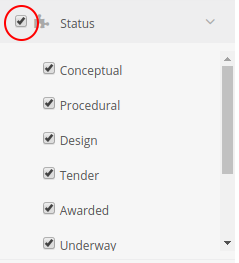 Click on the icon in the ‘RFQ Notice’ column. A pop-up block will open. 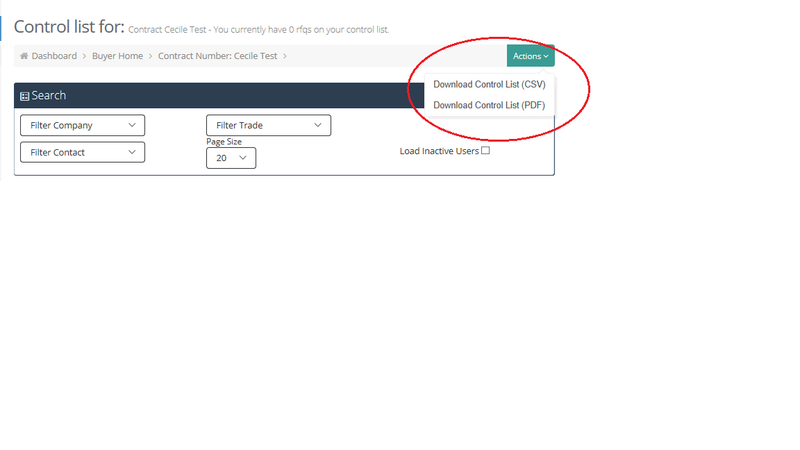 You can select “Select All” to send to all vendors on the Control List, or select the trade(s) you wish to send the notices to, and you are also able to exclude the vendors you have received the following responses from Declined, Quote Received and Vendor Responded. Once you have made your selection, click on “Proceed”. 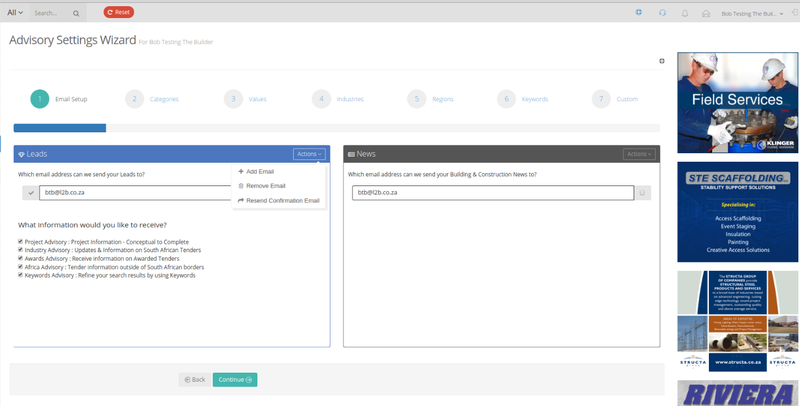 An email page will open and you can type the applicable message in the body and add one file to attach to the message if necessary. The file cannot exceed 5MB, and only Word, Excel, PDF and Image files are accepted. 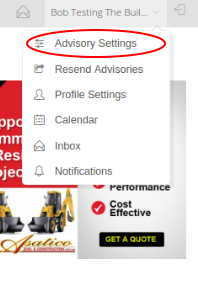 To view, previous RFQ Notices sent, hover over your name (top right-hand corner), and click on “Inbox”, or click on the “Inbox” icon just before your name. The first “RFQ Notices” in your “Inbox” is the notices that you have received and the second “RFQ Notices” under “Sent” are the notices that you have sent. 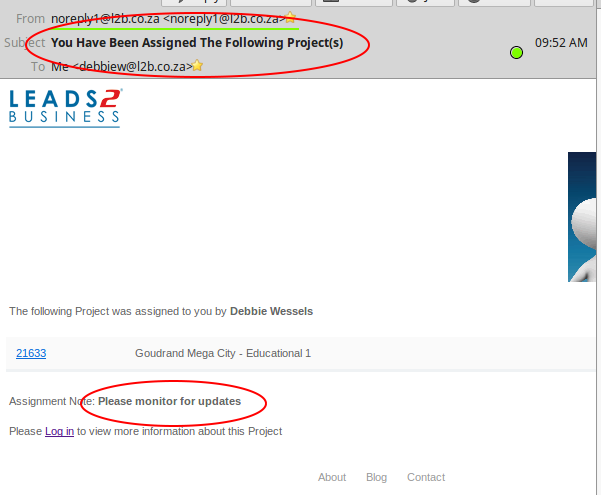 Once you have clicked on the “RFQ Notices” link, you can click on the subject and view the notice you have sent. 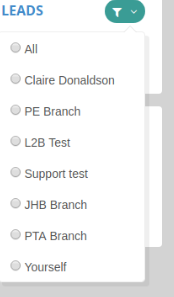 On the ‘Buyer Home’ identify the L2Q Project you wish to interact with, click on the icon in the ‘Control List’ column. This will direct you to the Control List that was created by sending out the RFQ’s. You are able to filter by Company, Contact or Trade. You can increase the size of the page, and choose to display any contact that might have been deactivated during the course of sending out RFQ’s and following up on them. The control list is listed alphabetically by trade. You are able to view the company and contact details by clicking on the links in blue. You can view the RFQ sent to the Vendor, resend the RFQ to the vendor and download the bill items (if the vendor has priced online, the downloaded document will include the pricing), in .csv or .pdf. 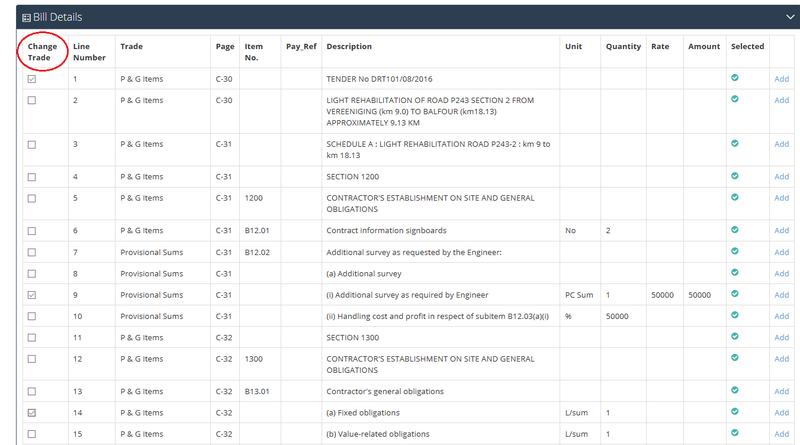 The green icon in the last column indicates that the vendor received the RFQ directly from you. 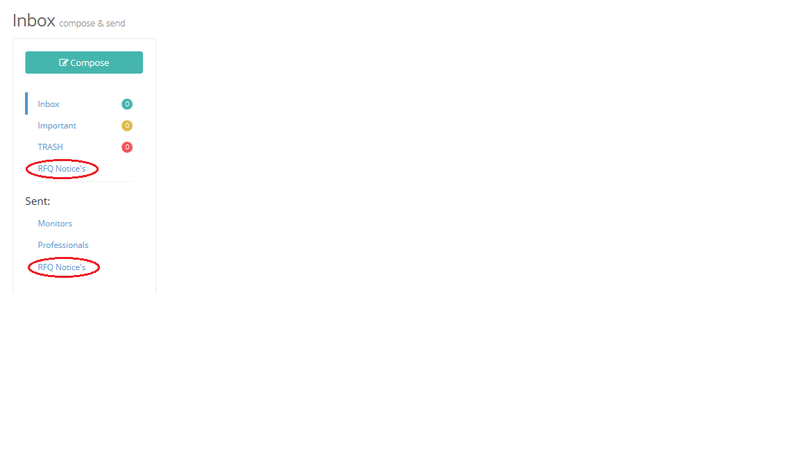 In the case where the icon is red, it means that the vendor is an Open Quotes subscriber and has accessed the RFQ through the “Open Pricing” feature. 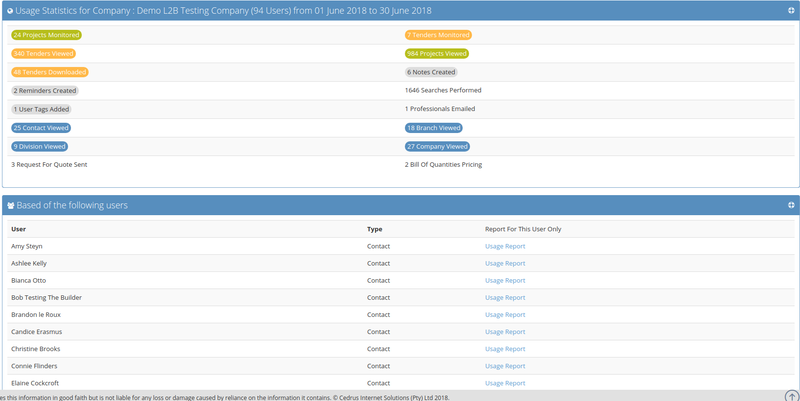 When a vendor has accessed the RFQ through “Open Pricing”, they may have chosen to price it online or it will show on the “Control List” because they have viewed it to see if they are interested in pricing the RFQ. ‘Response Status’ is updated by our L2Q team indicating the expected Vendor response they received while following up. You are able to update the response to what you have received as well, by clicking on “Response Status”. On the next page, click on the down arrow and select the response you have received. Click on “Add Note” under “Internal Comments” and add your note in the block that displays, you can also send a message to the vendor to thank them for their response: click on “Add Note” under “Message Vendor”, and then click on “Submit”. When resending an RFQ, you have the option of sending to another email address. 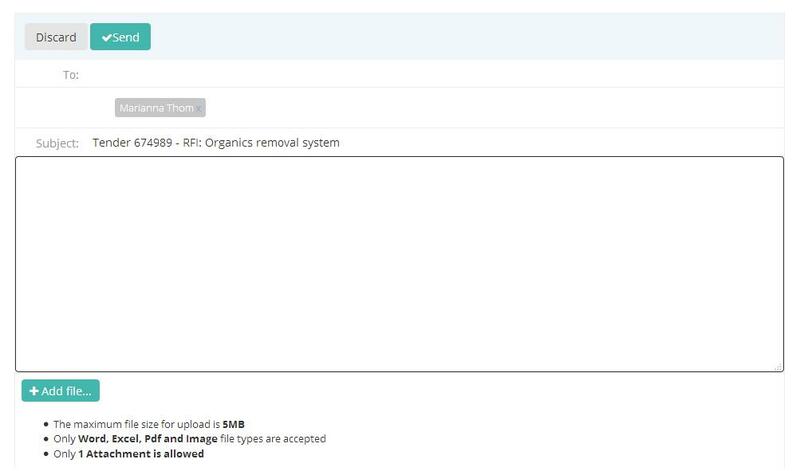 Once you have clicked on the icon under the “Resend RFQ” column, on the next page, it will show the details of the RFQ and the vendor you are resending to. If you wish to resend to the same contact, simply click on “Submit”. 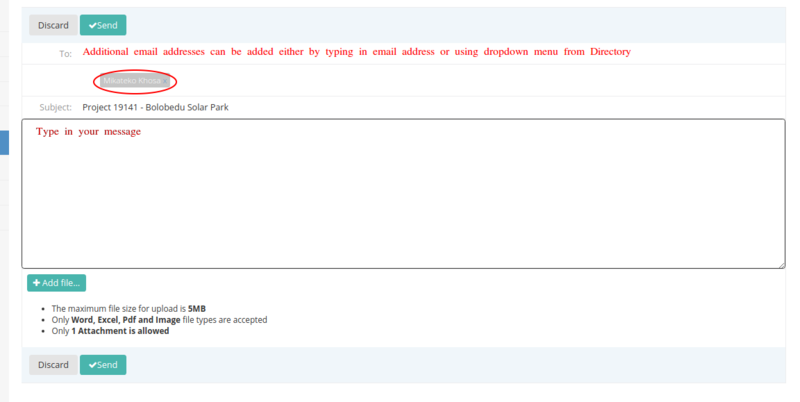 Alternatively, type in the email address in the “Once-off Email Address” field and click on “Submit”. 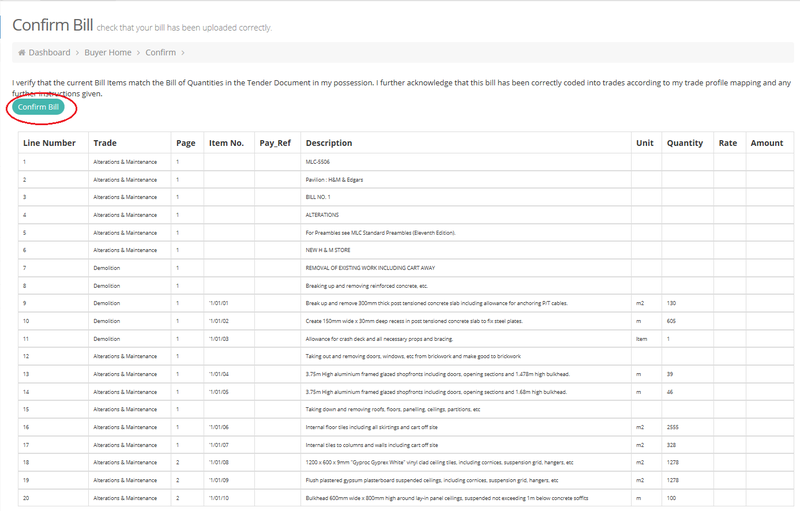 The Control List is a summary of all the Vendors that the Buyer has sent RFQ’s to. 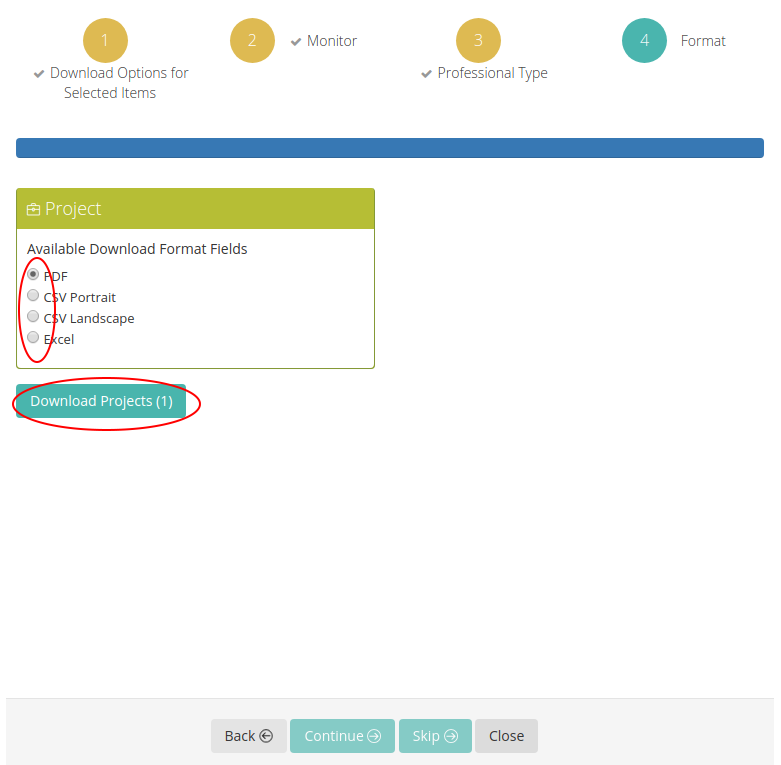 To download the Control list, identify the L2Q Project you wish to interact with, click on the icon in the ‘Control List’ column. 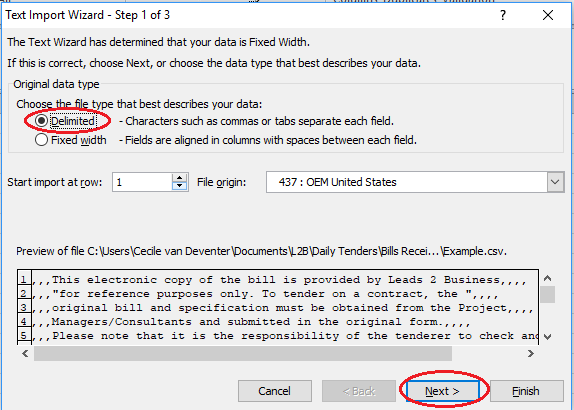 From the “Actions” link, select the format you wish to download the control list in (either .csv or .pdf). From the pop-up, select to either open the document or save it to your computer. 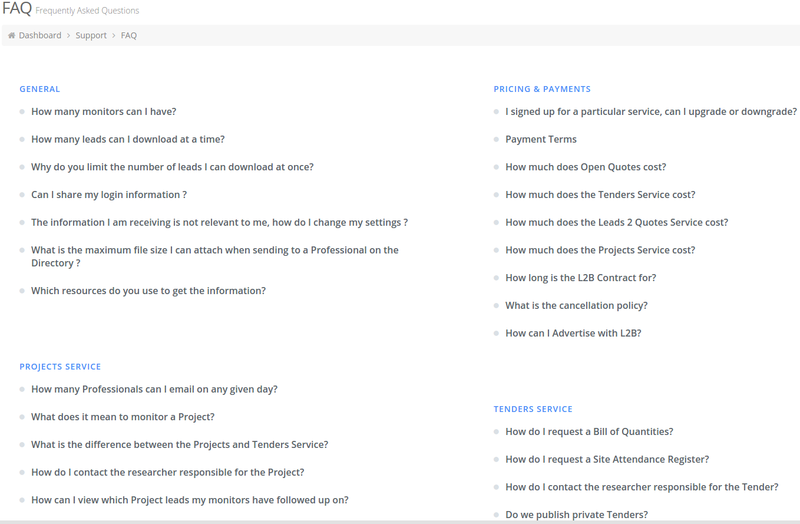 The saved document will display the vendors and their responses to the specific L2Q project you have chosen to download. 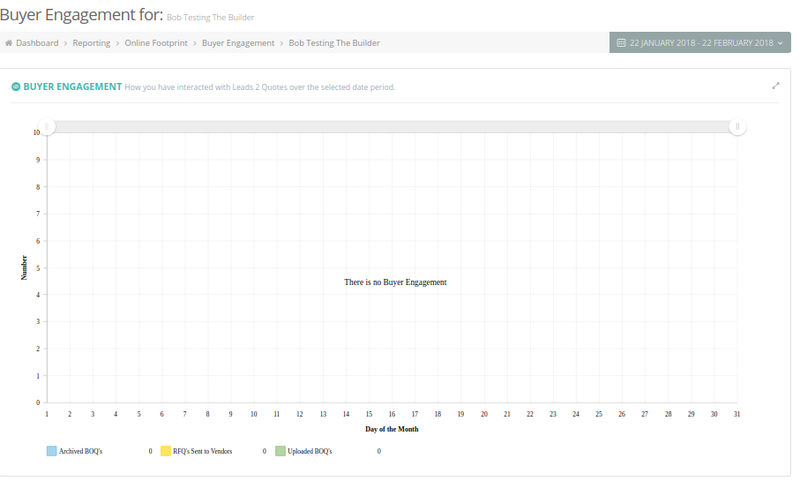 When you select a Vendor as preferred, they will display on your Buyer Homepage. When you send out RFQ’s, your “Preferred Vendors” will appear at the top of your search results, making it easy for you to find them. You are able to add Preferred Vendors to your “Preferred Vendors” list in a few ways. 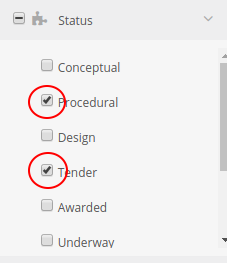 While you are sending out RFQ’s, you are able to mark vendors as preferred by clicking on the “Preferred” icon. 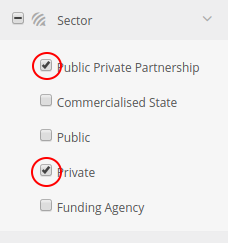 When the icon is not coloured in, it means they are not marked as a “Preferred Vendor”, to add them to your “Preferred Vendors”, click on the icon and when the page refreshes, the icon will be coloured in. On “Buyer Home”, there are two blocks – “New Vendors” (these are new vendors that have been added to our Directory in the last thirty days; and “Preferred Vendors” (all your preferred vendors are available from this list). To add a vendor from the “New Vendor” to your “Preferred Vendors”, click on the preferred icon next to the branch name. 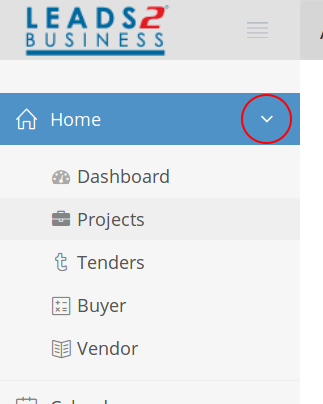 To search for preferred vendors, click on the “Actions” link and select “Preferred Vendor Search” from the drop-down menu. 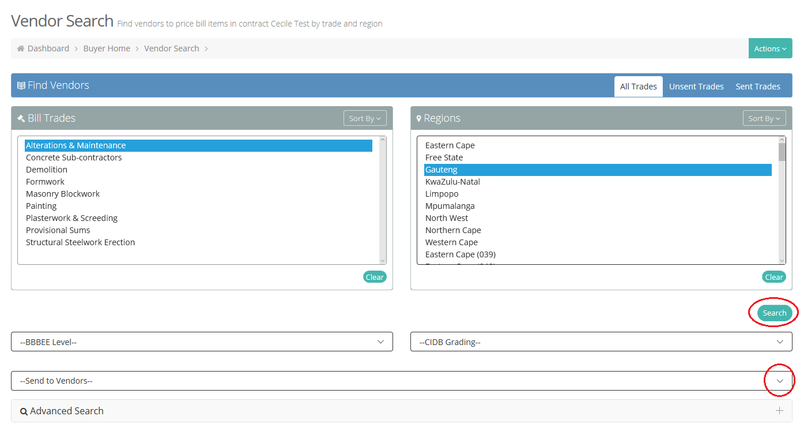 Select the trade and region, and you can further narrow the search down by selecting BBBEE Level and CIDB Grading. Click on “Search”. 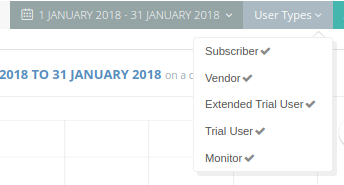 To add multiple preferred vendors, tick next to the contact names on the right, scroll to the bottom of the page and click on “Add Preferred Vendor”. 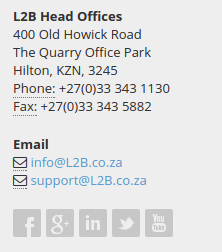 If the Vendor is not in the Directory, you can request that they are added as a Preferred Vendor to your profile, by sending an email to Directory@L2B.co.za with the company name and contact details. 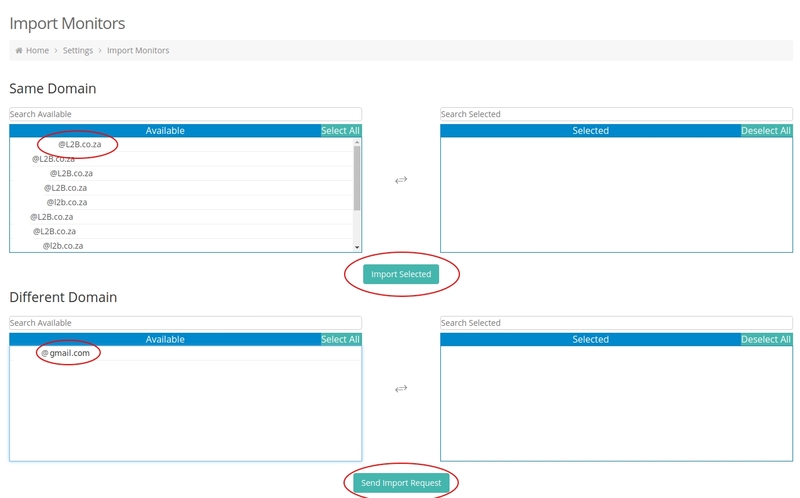 Advanced Search allows the Buyer to distribute selected items, to a different Trade when sending out RFQ’s. You are able to search by keyword or page number(s). 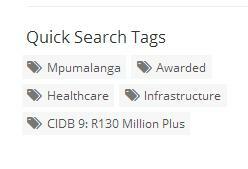 Enter the search terms and click on “Find Bill Items”. The items will display below “Advanced Search”. 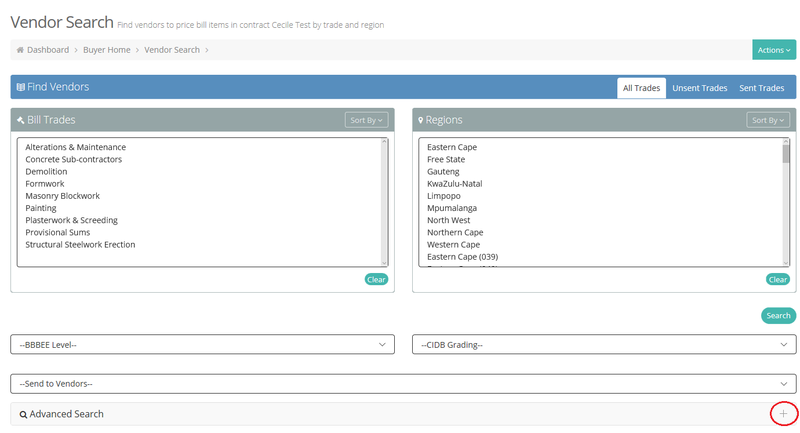 Select the items you wish to send to another trade by ticking the boxes on the left. Then scroll up and select the trade and region you wish to send the items to and scroll down past the items and click on “Search”, right at the bottom of the page. Repeat the selection and sending out process on the next page. 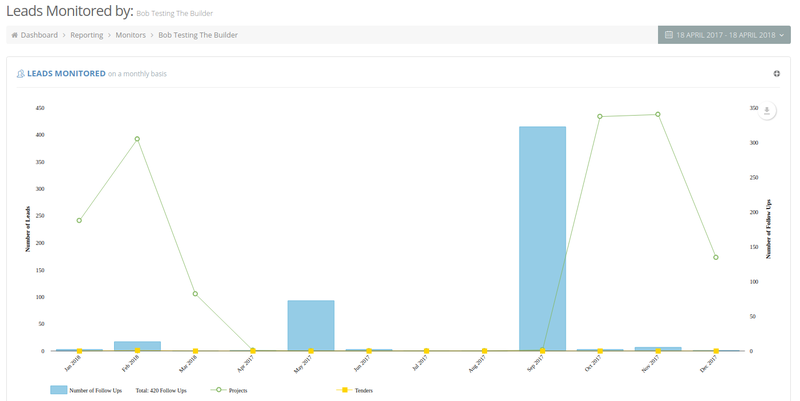 Once your Bill of Quantities is uploaded, you are able to send out your Bill Trades to Vendors and/or Subcontractors. 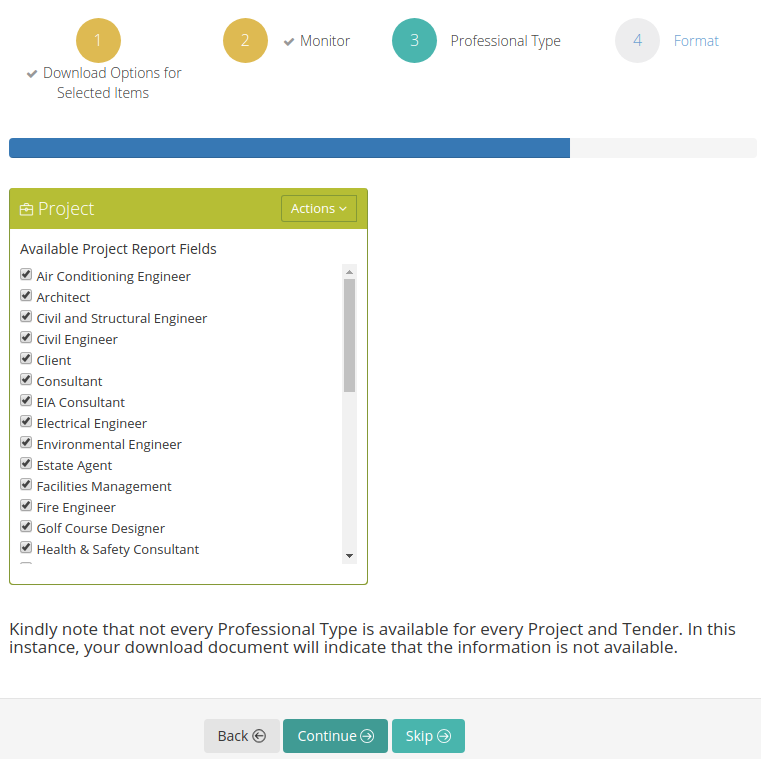 On ‘Buyer Home’, identify the L2Q Project you wish to send out and click on ‘Request Prices’. You will be directed to your ‘Terms and Conditions’. 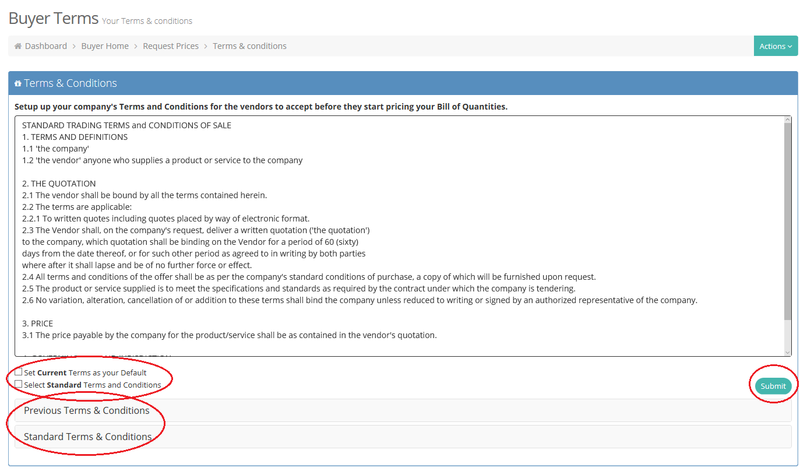 Enter your company’s Terms and Conditions or select our ‘Standard Terms and Conditions’ (our Standard Terms and Conditions is an editable template). Alternatively, select from the Terms and Conditions you have previously used. The terms and conditions have to be added in order to continue. You will be directed to the page to Confirm your Bill of Quantities (check that bill item are correct and in the correct trades). At the bottom of the page, you can click through and check each page, before clicking on “Confirm Bill”. 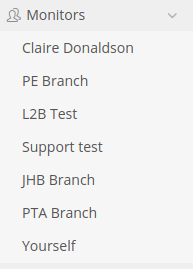 If there are any discrepancies, please contact the L2Q Department (BoQ@L2B.co.za or +27 33 343 1130). 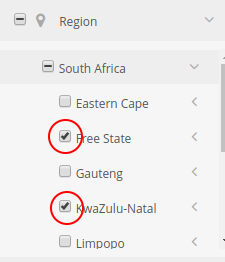 You can select the trade(s) and region(s) you wish to send out. 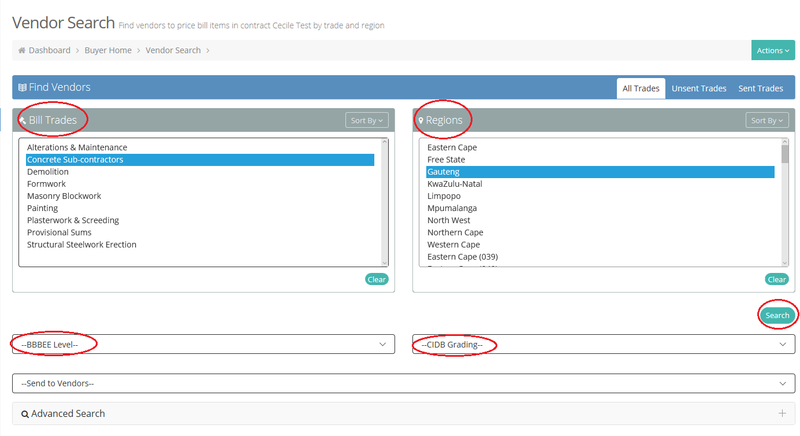 If you are looking for a specific BBBEE Level or CIDB Grading, you can select these from the drop-down menu’s and click on ‘Search’. The bill items you will be sending out reflect at the top of the page. 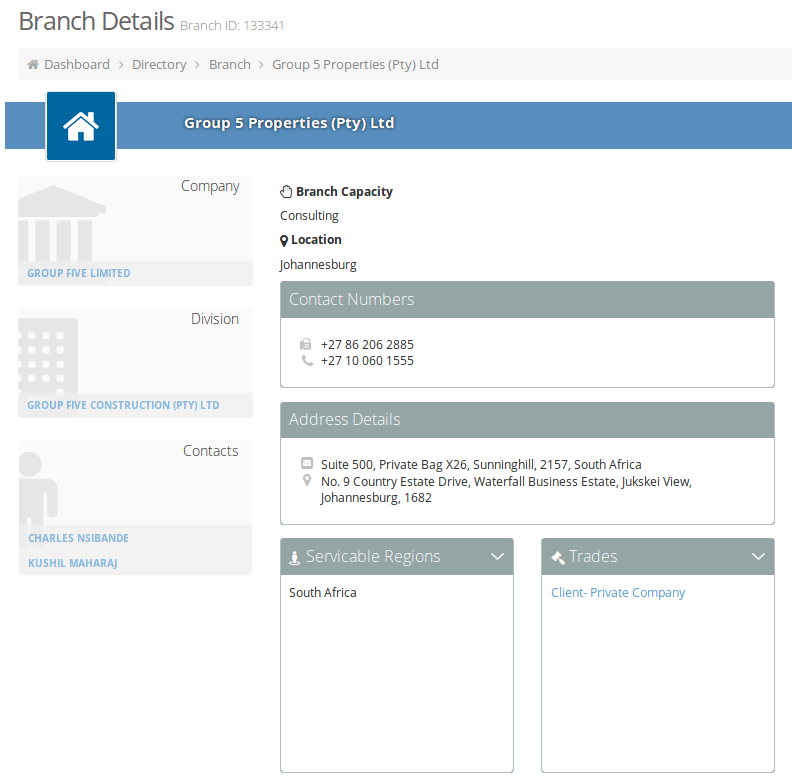 You are also able to search for a specific company, via branch name and/or description. 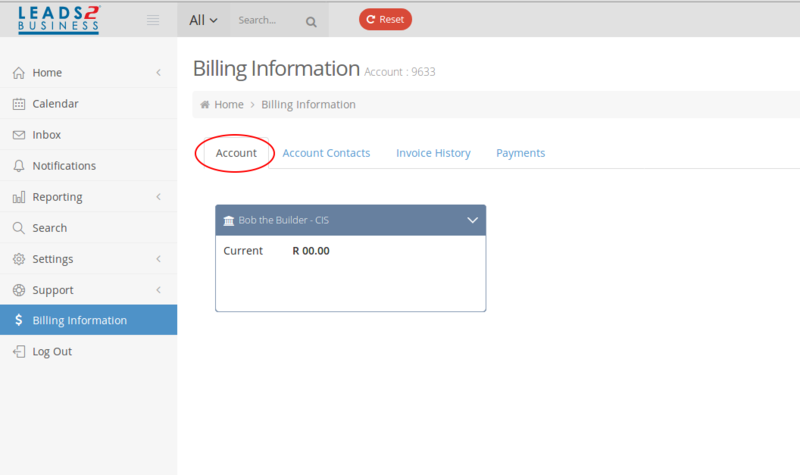 You are able to access “My Bill”, “My Terms” and “View Added Bill Items”, and also sort alphabetically or by Preferred Vendors, by utilizing the “Actions” link. 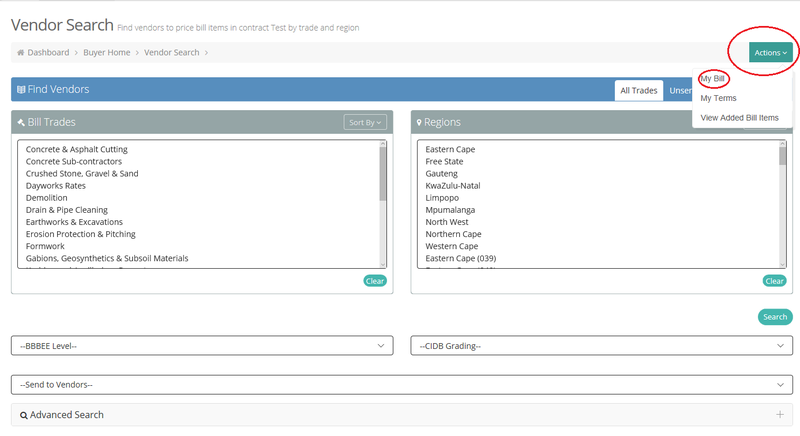 The system boasts various criteria to help you make your choice of Vendor including (but not limited to) – Company name, Description, Trades, Area code, Region (Serviceable Regions are in brackets), BBBEE status (if available), Capacity and Indicators. 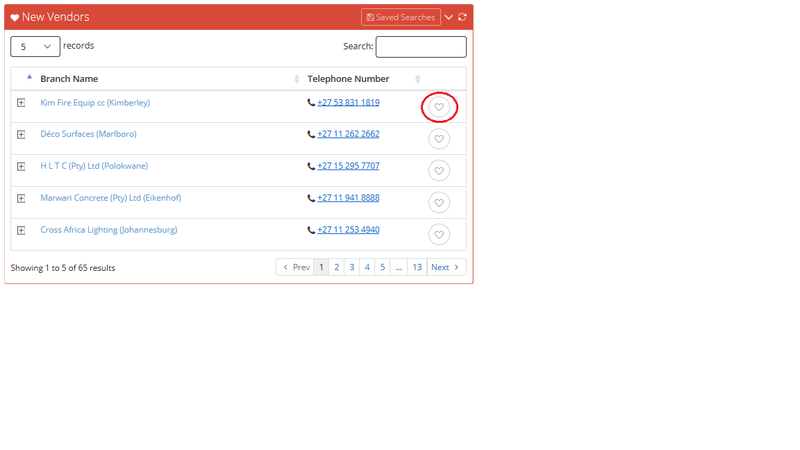 Make your selection by ticking in the boxes to the right of the contact person, scroll down and click on “Send RFQ”. You have the ability to send an SMS to the Vendors / Subcontractors, however, it is recommended that this function is de-selected if RFQ’s are being sent out late. 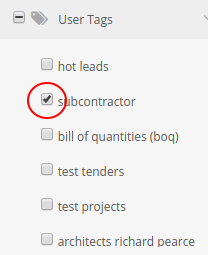 You can also go to the next page of Vendors / Subcontractors, after sending on the first page, making a selection and then sending to them. You are able to Print / Preview the RFQ before sending out. 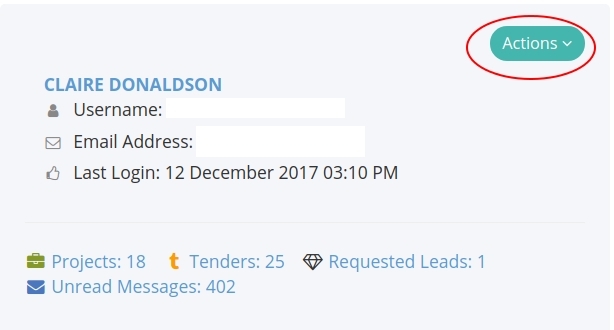 After clicking on “Send RFQ”, the page will refresh, and now the trade, the date and the time will reflect under the contact person it was sent to. There is also the ability to “View RFQ” and “Resend RFQ”. Once the current trade has been sent, you can select the next trade from the Trade(s) and Region(s) at the bottom of the page and click the ‘Search’ button. Repeat until all trades have been sent out. There is a feature that allows one trade to be sent to another trade in its entirety. Choose the trade you wish to send to another trade and then region. 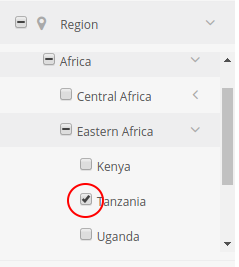 From the dropdown menu, select the trade you wish to send it to and then click on “Search”. Repeat the selection and sending out process on the next page. 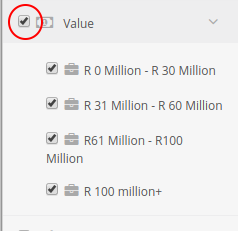 On the ‘Buyer Home’, click on ‘Request Prices’ of the control list you wish to add items to. 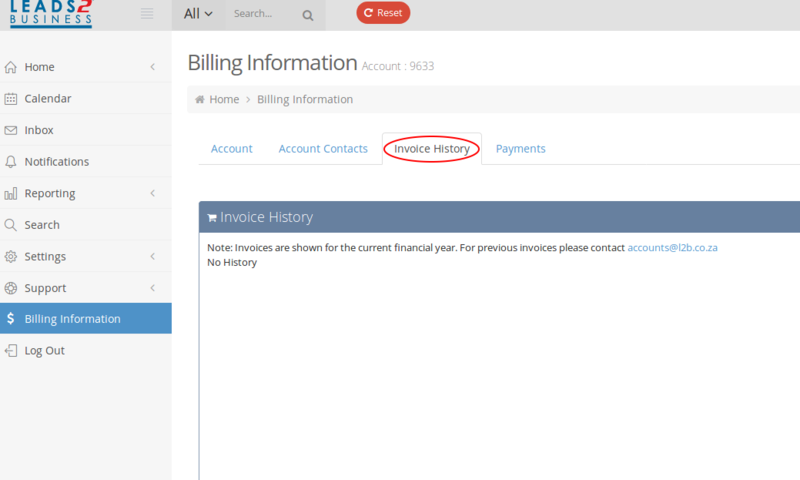 Click on “Actions” and select “My Bill” from the drop-down menu. 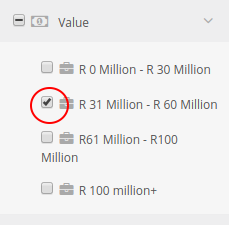 Use the filters at the top of the page to find the section in the bill where you wish to add item(s). 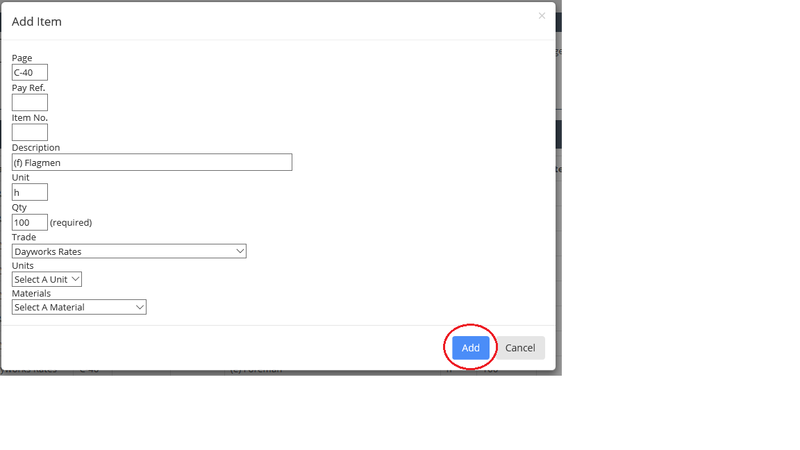 Once you have found where you wish to add the item/s, click on “Add” on the far right of the item you wish to add to. 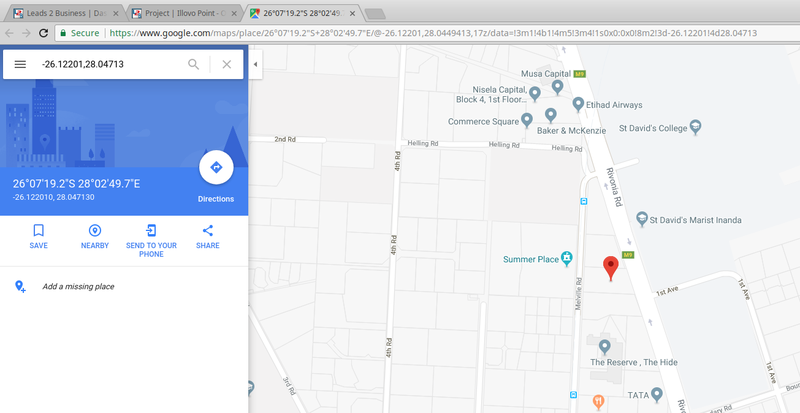 A pop-up will appear, where you can change/add the page number, Payment Reference, Item Number, Description, Unit, Quantity and if you wish to change the trade, you are able to. Once you have entered the necessary information, click on “Add”. 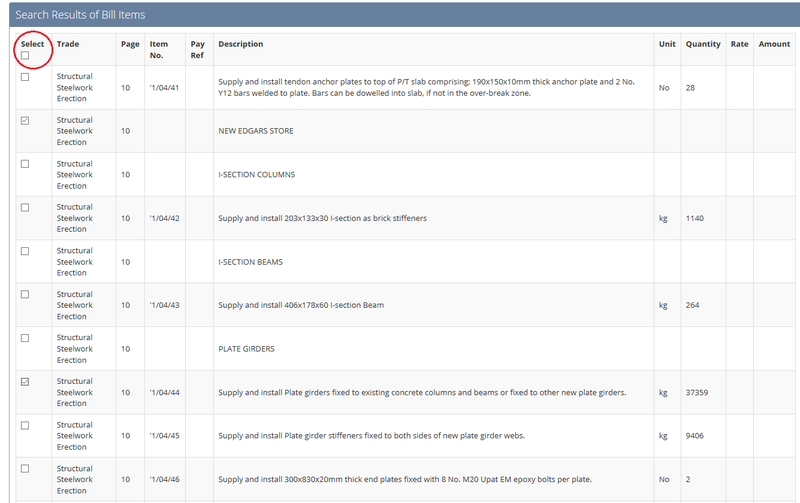 The page will refresh and the item will be directly under the item you have added it to, highlighted in light blue. 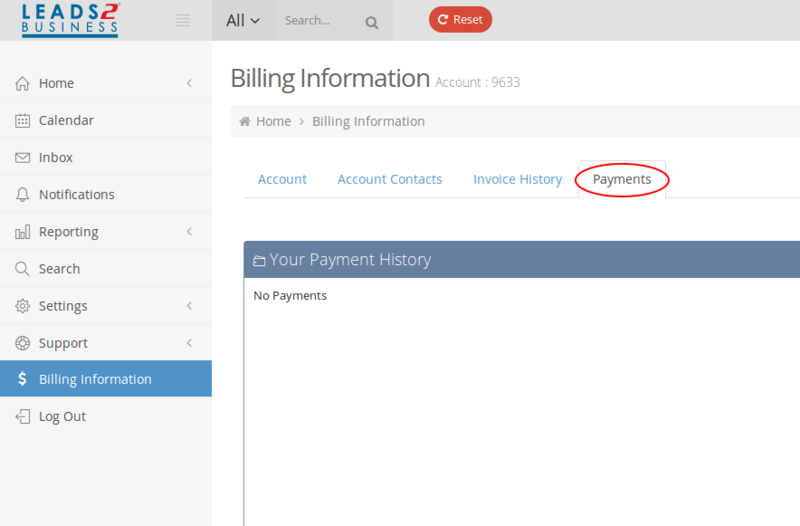 To see all the items you have added to your bill, click on “Actions”, and select “View Added Bill Items”. You are also able to change your terms and conditions from the “Actions” link if needed. On the ‘Buyer Home’ click on ‘Request Prices’ of the bill, you wish to change trades in. Once the Bill has loaded, choose ‘Change Trades’. 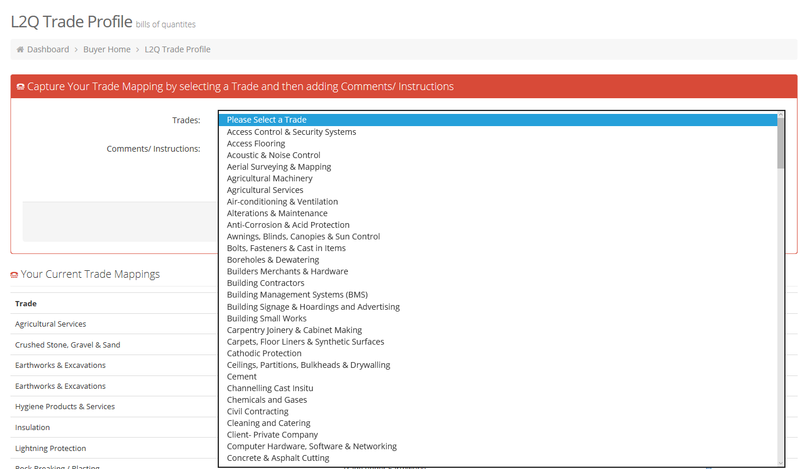 You can now choose to change all instances of a trade in all pages of the Bill of Quantities to another trade or choose specific items that you would like to change trades for. In order to change one entire trade to another trade, select the trade you wish to change in the first block and the trade you wish to change it to in the second block, and then click on “Change Trades”. This action will move all instances of a trade on a Bill of Quantities to another trade, based on your selection. 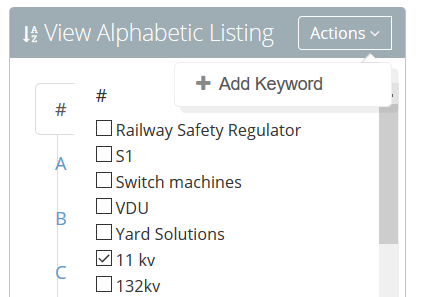 To change only specific items to another trade, use the filters at the top of the page to find the items you wish to change (you can filter by trade or bill page numbers, and you can adjust the size of the page). 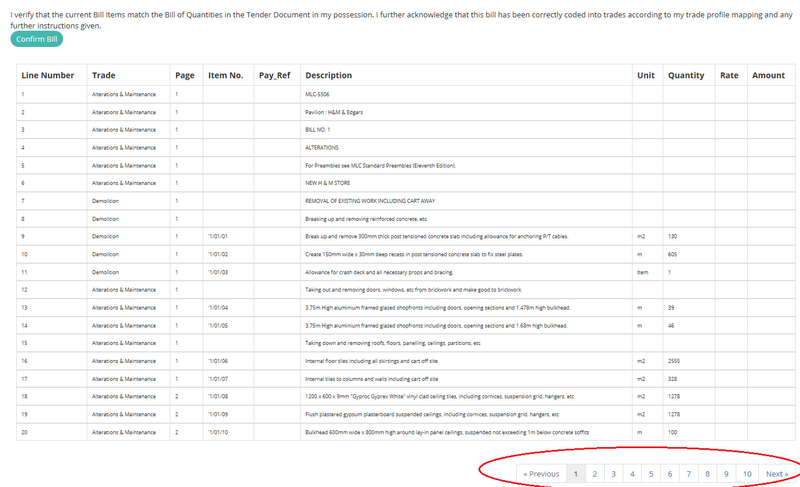 Once your filtered results display, scroll down to the bill items and select the items you wish to changes by ticking the boxes on the left in the Change Trade column. Then scroll up to the “Change Trades” and choose the trade you wish to change the items to from the drop-down menu and click on “Change Trades”. The selected items will now reflect under the trade that was chosen. 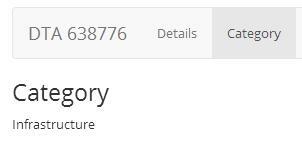 To view uploaded drawings/specifications, click on the icon under the “Drawings / Specifications” column next to the relevant L2Q project on the Buyer Home. 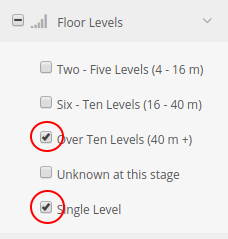 Select “Drawings” and download the relevant drawings/specifications on the next screen. (If there are no links to download, we did not receive any drawings/specifications). As some drawings may be quite large, we suggest that they are saved to the computer, by right-clicking on the link and then choosing “Save As”. 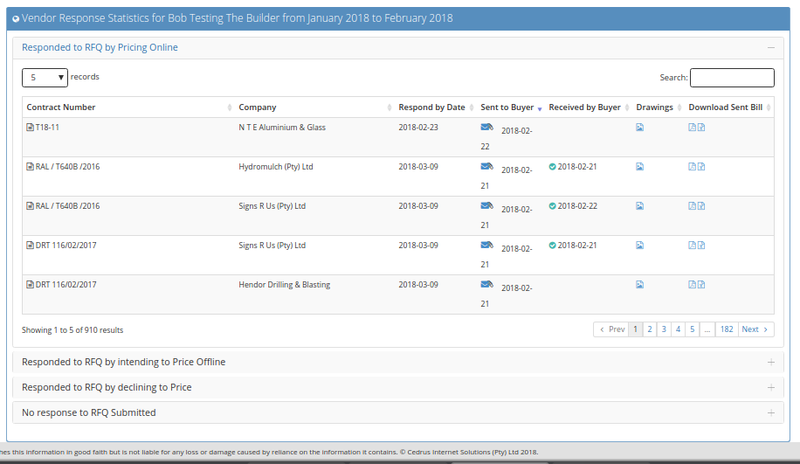 To alter the Respond by Date (due to extension of the project), click on the relevant Contract Number of the L2Q Project on the Buyer Home. Alter the information and click the ‘Submit’ button. Please note that in order for the Vendors to be informed of this change after you have distributed your Bill you can tick next to “Send Email” to notify them. The Respond by Date will need to be changed if more RFQ’s need to be sent out after the Respond by Date has passed, as the system will not allow RFQ’s to be sent after the Respond by Date has passed. Trade Mapping allows the Buyer to specify which trade they would like a specific trade to fall under. For example, instead of splitting Crushed Stone, Gravel and Sand to this trade, they might prefer it to be left with Earthworks and Excavations. This trading is done before the bill is uploaded. 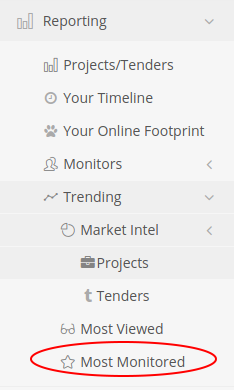 To map a trade to your custom preference, click on “Actions” and select “Trade Profile” from the drop-down menu on your Buyer Homepage. 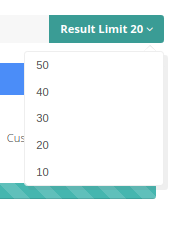 Select the trade you wish to customise from the drop-down combination box. In the comments box, type up the instructions on how you wish for this trade to be coded, followed by clicking the ‘Submit’ button. 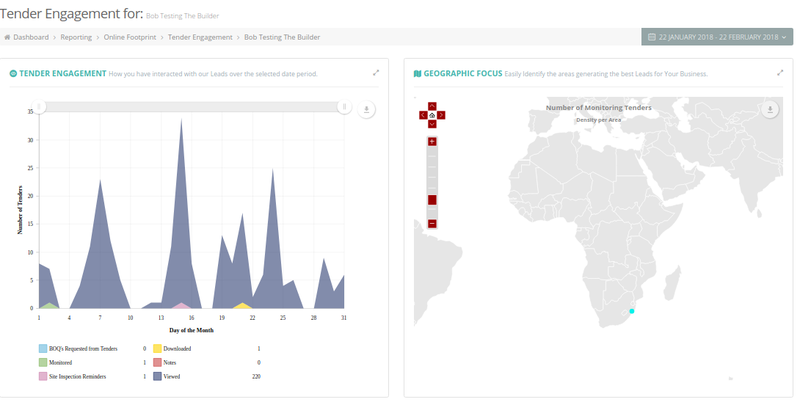 You will receive visual confirmation in the form of a green bar at the top of your screen confirming the mapping information has been saved. All your trade mapping will be displayed at the bottom of the screen. 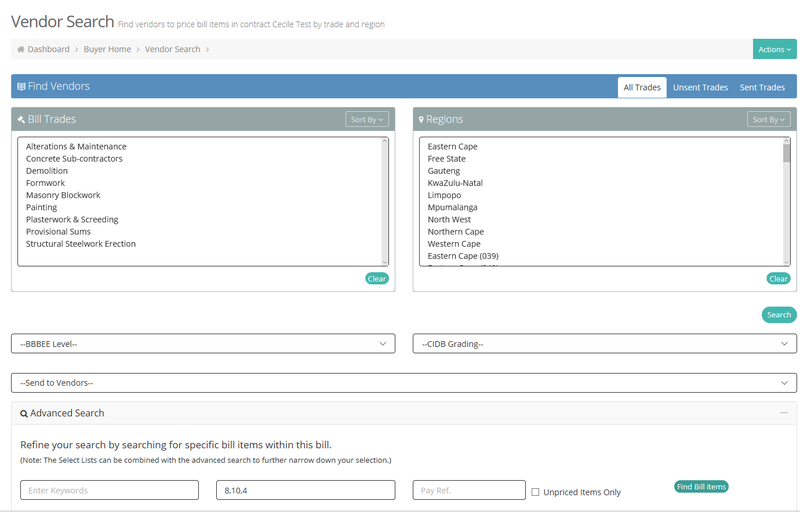 All Trade Mapping added to the Buyer’s profile, will be applied to all future bills after the trade mapping has been added. Default tags and custom tags you have added will be available under User Tags. 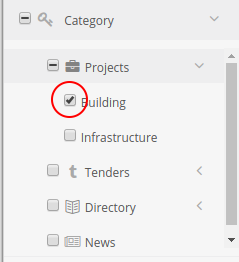 You select the tick icon to tag the Project/Tender. 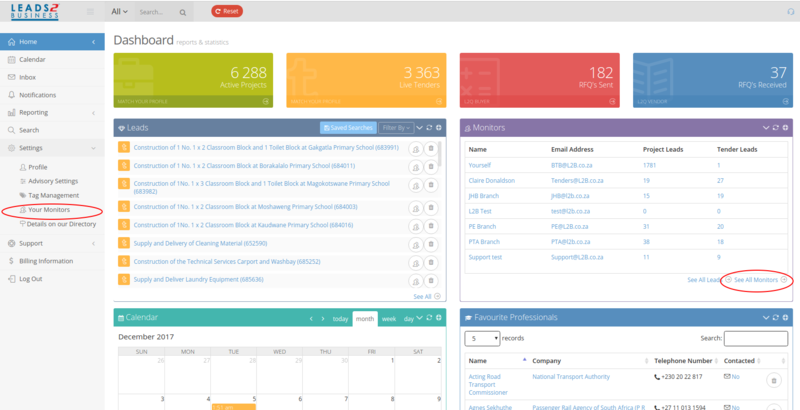 This will list these contacts on your Dashboard under Favorite Professionals and you can access them easily. Once you have completed the pricing process and the closing date has passed, you can archive projects. Should you wish to view this project again you are able to view this project at any time in the archive list. 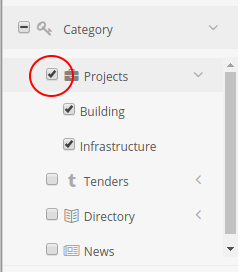 To archive a project or multiple projects: tick in the boxes under the archive column, and click on “Actions”. 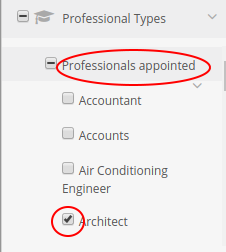 From the drop-down menu under “Actions”, select “Archive Job(s)” (L2Q project(s)). 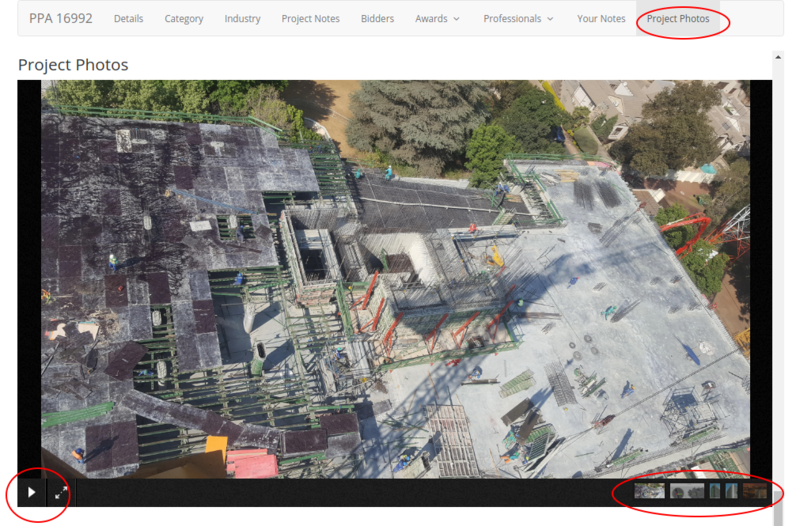 To view your Archived L2Q Projects, click through to the Buyer Home. Click on “Archived” and your archived L2Q projects will be displayed. 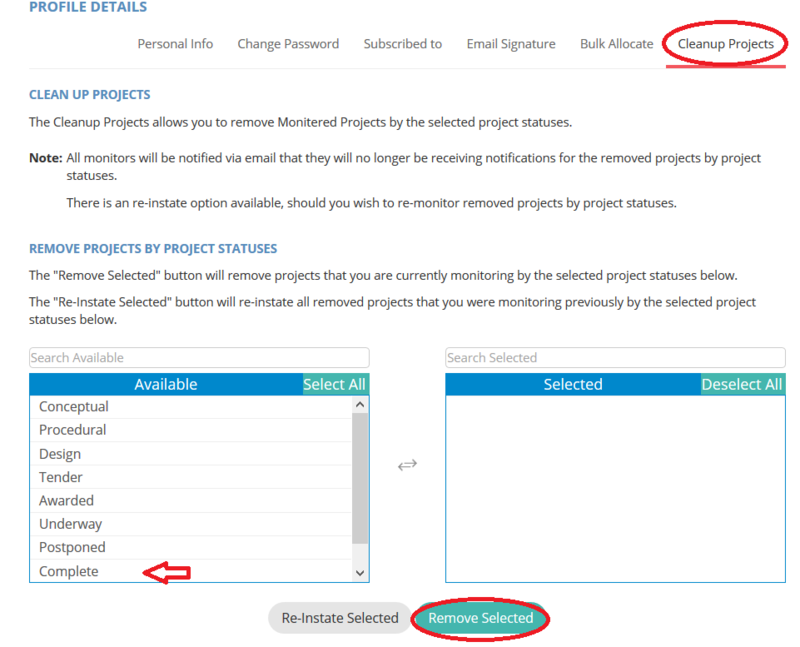 You are able to reinstate projects for redistribution, by ticking the boxes under the reinstate column and clicking on “Actions”. 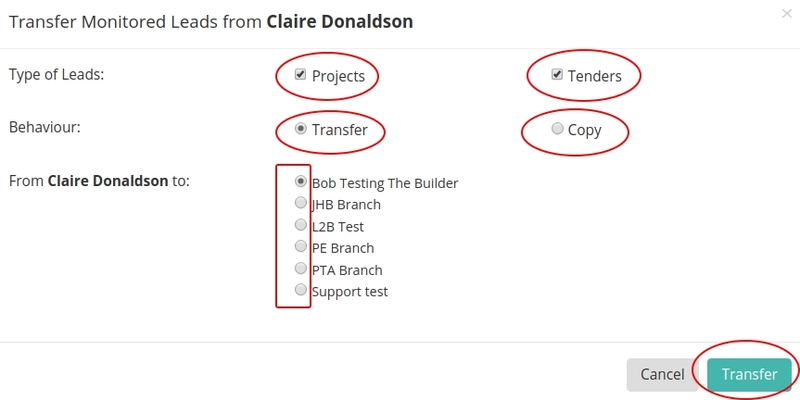 From the drop-down menu under “Actions”, select “Re-instate Job(s)” (L2Q project(s)). This will move the project back to your active L2Q Projects. •Your Bill of Quantities is being processed. •We have received your request and are awaiting your Bill of Quantities or trying to source the BoQ. To view your Pending L2Q Project application, click through to the Buyer Home. 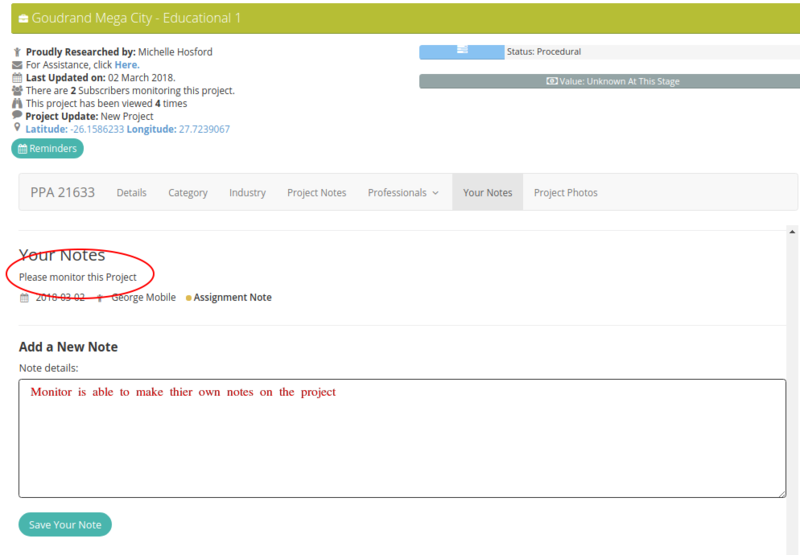 Click on “Pending” and once redirected, your pending L2Q projects will be displayed. An active L2Q project is where we have received the Bill of Quantities, processed and uploaded it, and the bill is ready for distribution by the Buyer. 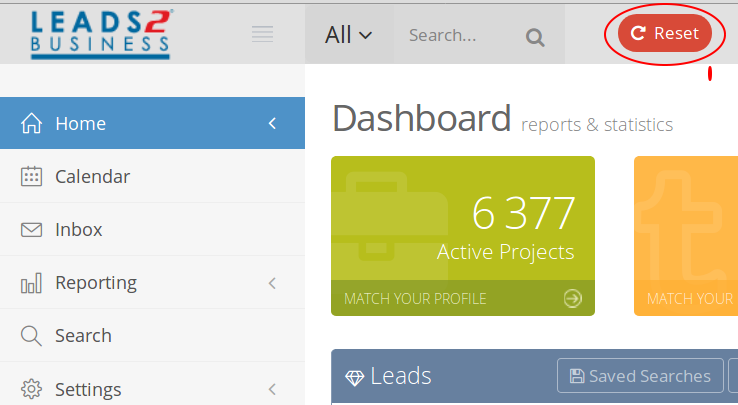 To view your active L2Q projects, you would need to click through to the Buyer Home. 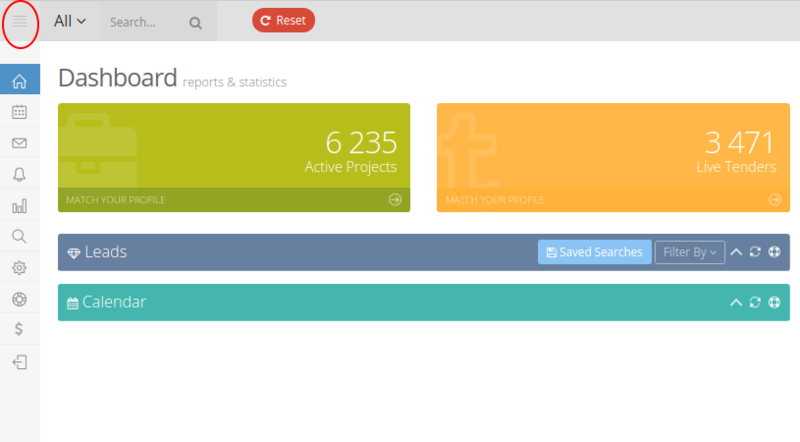 Once redirected, your active L2Q projects will be displayed. 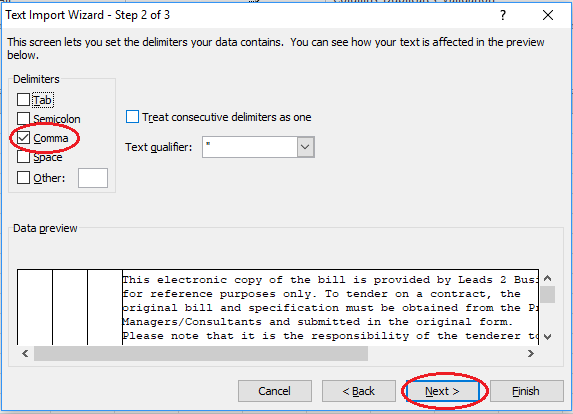 In order to send out trades to vendors and/or subcontractors on a BoQ to gather your prices for the contract you are tendering on, you are required to “Create a New Bill Request” (also referred to as an “L2Q Request”). 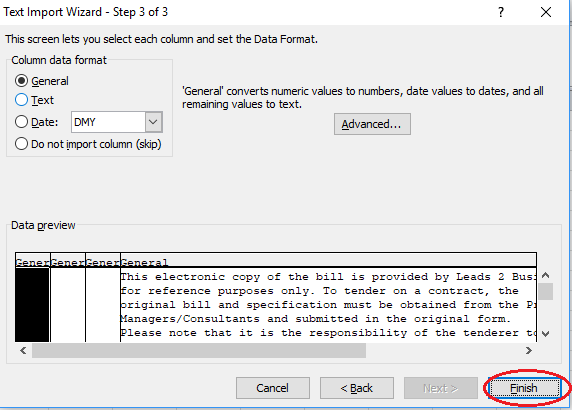 The Bills of Quantities (BoQ’s) are preferably received as Excel documents, however, should a .pdf be the only available format, we are able to process these documents. Due to the conversion process, this will incur additional lead time. •The Closing Date (Your Tender / Project closing date). •The Respond By Date (The last date you wish Vendors to respond to you by, in order for you to accept their pricing information). •The Contract Start Date (The date upon which the proposed tender will commence). •The Professional Details (Name of the Quantity Surveyor in order to source the BoQ). •Professional Contact details, specifically their phone number and e-mail address. •The Client Details: The Organisation funding the Tender. •Comments: For any additional information you wish to include and communicate with the L2Q support team. Any application submitted to the Leads 2 Quotes Department must allow for a 3 day pricing period from the date the RFQ’s are dispatched until the respond date stipulated. 1. Contract Details – as found in the tender document or invitation to tender. 2. Trade Mappings – the trades mapped here, will be added to the permanent Trade Mapping, which will be applied to all future bills. 3. Uploading of Drawings or Specifications relating to the Tender / Project – only one file can be attached and may not exceed 4MB, if the file exceeds this size, please email to BoQ@L2B.co.za. 4. Summary and Confirmation of the Request Details – confirm that details and documents added are correct. Electronic Bills of Quantities (Excel, Word, Bill, WinQS, CCS, etc.) – a minimum of 24 hours depending on size and quality. Scanned or PDF Bills of Quantities – a minimum of 48 hours depending on size and quality. 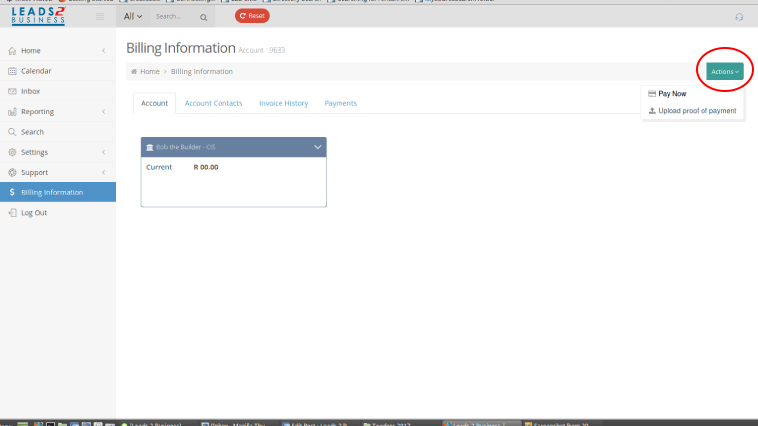 Once logged in on your Dashboard, click on “Buyer” on the menu on the left or “L2Q Buyer” on the bottom of the red block. Is defined as the Main Civil and Building Contractor (Estimator or Buyer) that sends RfQ’s (Request for Quotes) to Vendors (Sub-Contractors and Suppliers). 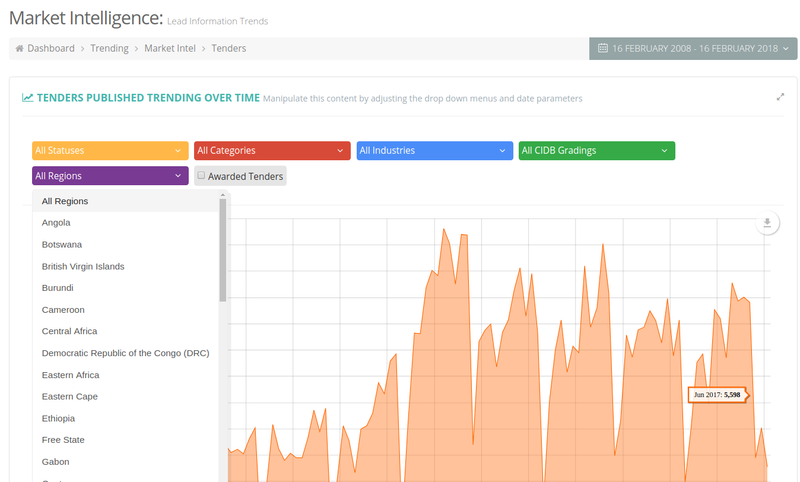 Monitoring enables you to receive regular updates via e-mail on any changes to the Project or Tender Notice (i.e. Closing Date extension, status change, etc). 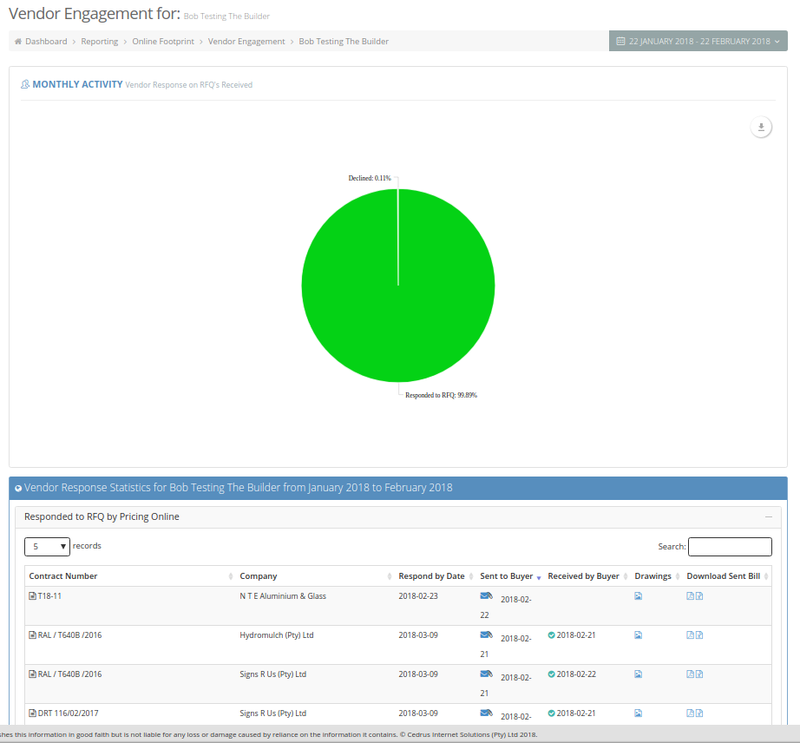 This feature also enables you to draw reports of all monitored items. A maximum of 5 staff members or colleagues within your company may be set up, to whom you may electronically allocate projects and tenders to. 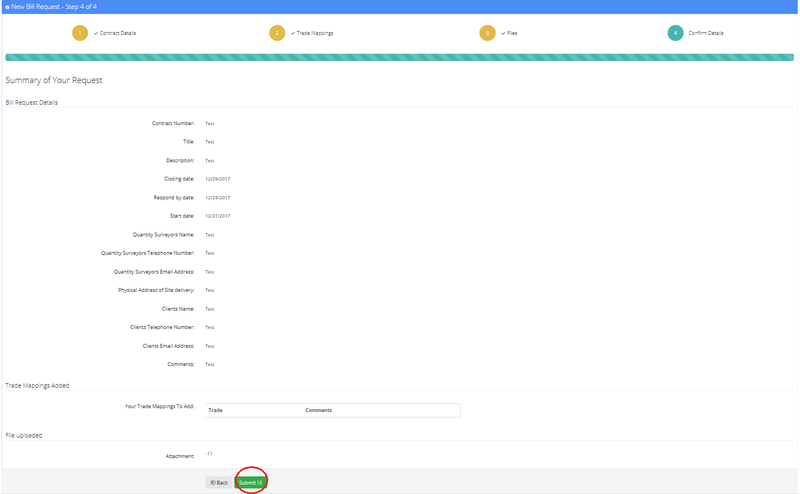 “Tag Management” is where where you can view and manage your Tags such as create, remove, rename, copy / transfer tags and download tagged leads by using the various Actions bars. “Details on our Directory” will take you through to the “Directory Entry Wizard” where you can edit your Company information and how it reflects on our Directory by following each step while completing the required information and then clicking on which will only appear on Step 6. 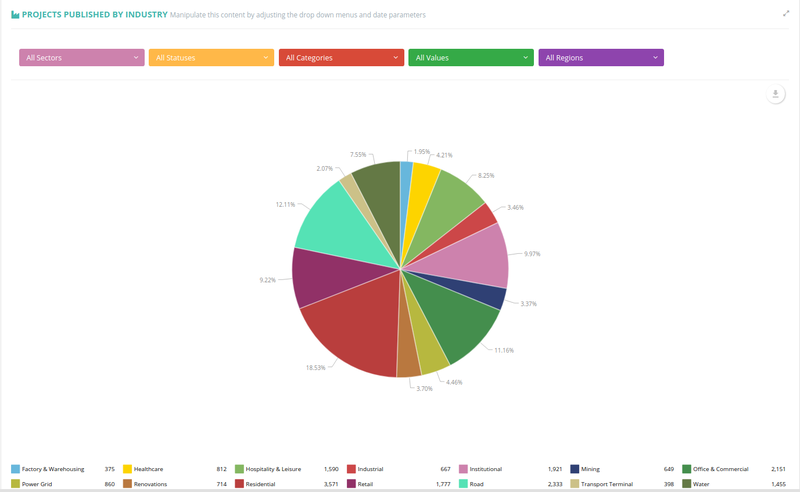 This is where you can see a visual overview of what content Leads 2 Business have published. 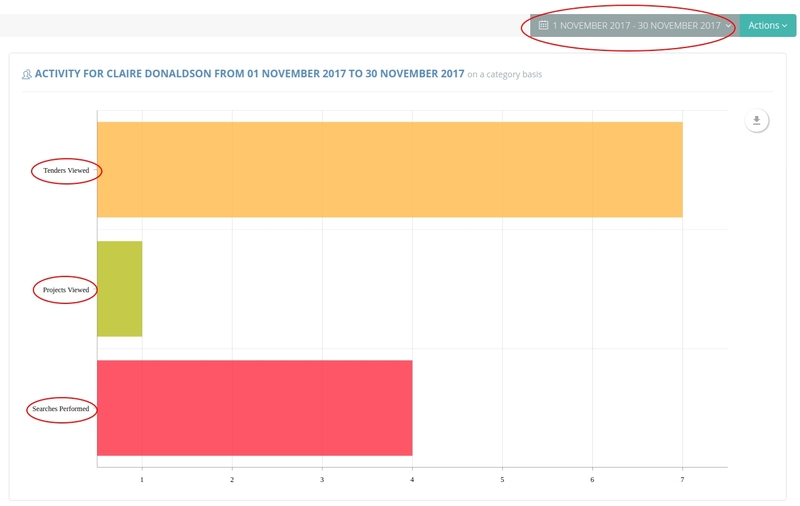 You can select your preferred date range at the top of the page and click apply, this will apply your date range to all the graphs. 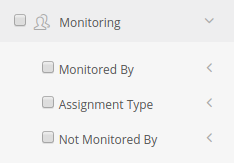 To manage your monitors, go to your Dashboard, Click on “Settings” and Select “Your Monitors”. This will open a page where you, as main user, are listed firstly, then your monitors. To add a new monitor: Click on “Actions” in the Top Right Corner of the Page, then select “Create a Monitor”. Please ensure that the monitor you need to add, has the same domain name as the main user. There is a limit of 5 monitors. Each extra monitor, is at an additional fee. 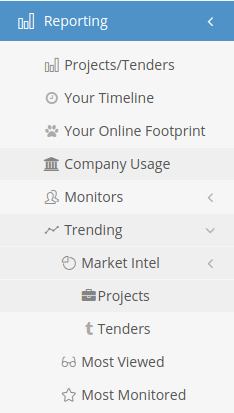 Under the “Actions” button at the top right of the page, you can also “View Archived Monitors”. Here you can un-archive a monitor at a time, that you need to activate again. By clicking on the little arrow, next to the applicable monitor’s name. Should you not have archived any monitors yet, this feature will not be available to you yet. Bare in mind your limit of 5 Monitors. Should you wish to edit an existing Monitor, Go to the monitor on the list, and click on the “Actions” right, above their name. “Archive Monitor” – If you wish to remove this monitor off your list of monitors. They may have left this company. Or no longer deal with tenders. Your list of monitors will automatically refresh when you select this option. 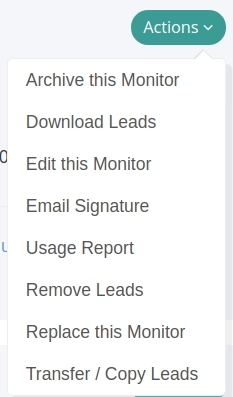 “Download Leads” – Download leads that are assigned to this monitor. 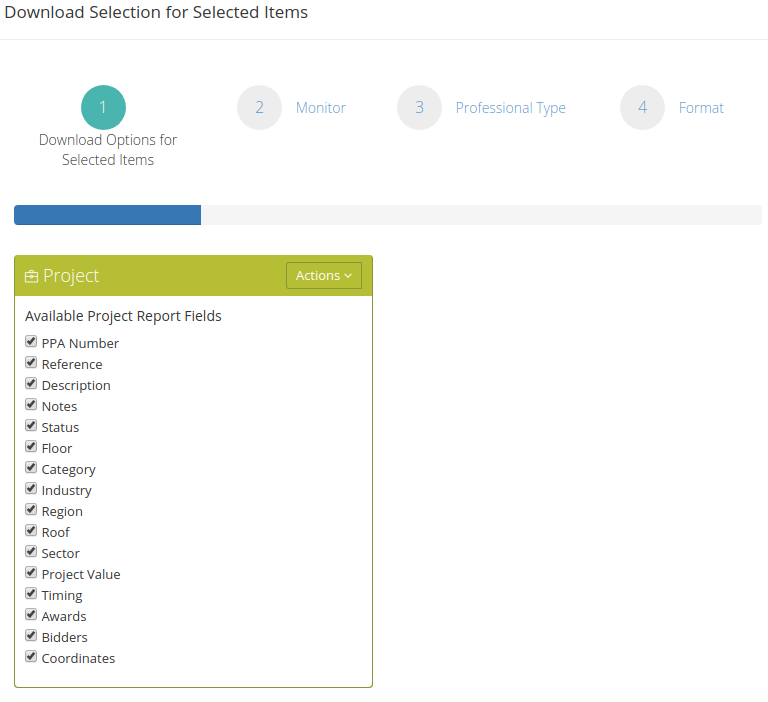 You can Make selections, based on what you need your download to contain (click on Continue, to proceed with the selections), then download Tenders/ Projects. 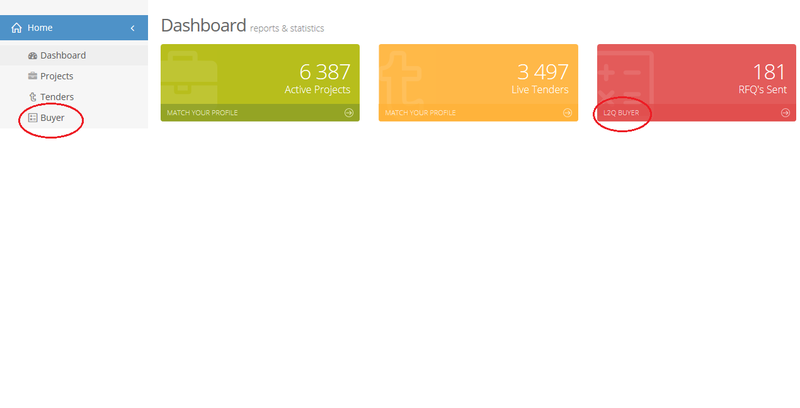 Note that these are only tenders and projects monitored by this monitor. You can only download one at a time (eg. Tenders or Projects, not both). For more information view Download this Lead. “Edit this monitor” – in the instance where you need to change a monitor’s surname (if they got married; or it was misspelled when created). This is also where you can change their password. You can also update the Email address, as long as it abides by the same domain rule. 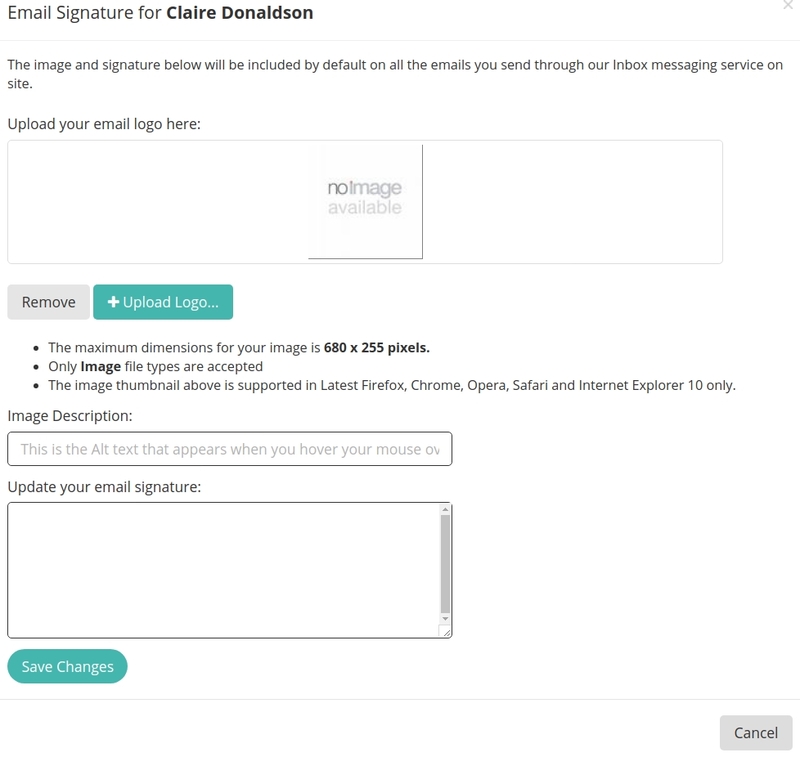 “Email Signature” – You can upload a Logo and signature for your monitor. The Monitor can also do this from their own Dashboard, under “Settings”, “Profile”. 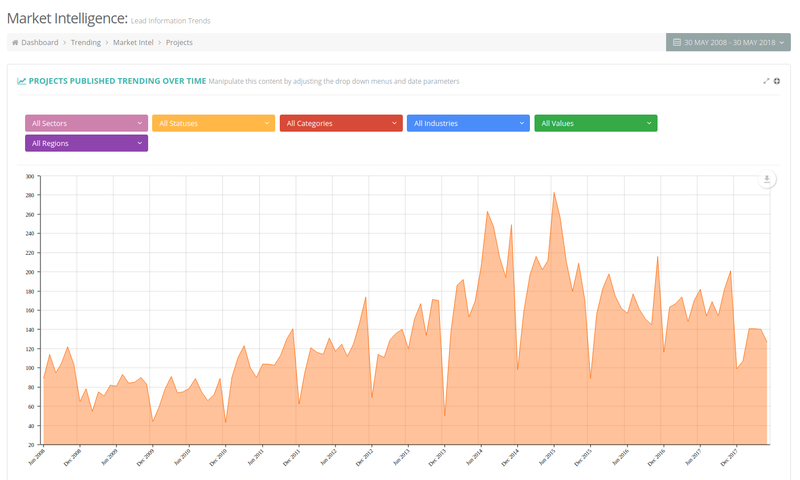 “Usage Report” – A breakdown of searches done, tenders and/ or projects viewed.This is based on a date range (defaults to the last month), but you can change it based on the statistics you may need. You can also change the data that displays, under “Actions” or download the information, using the download arrow. 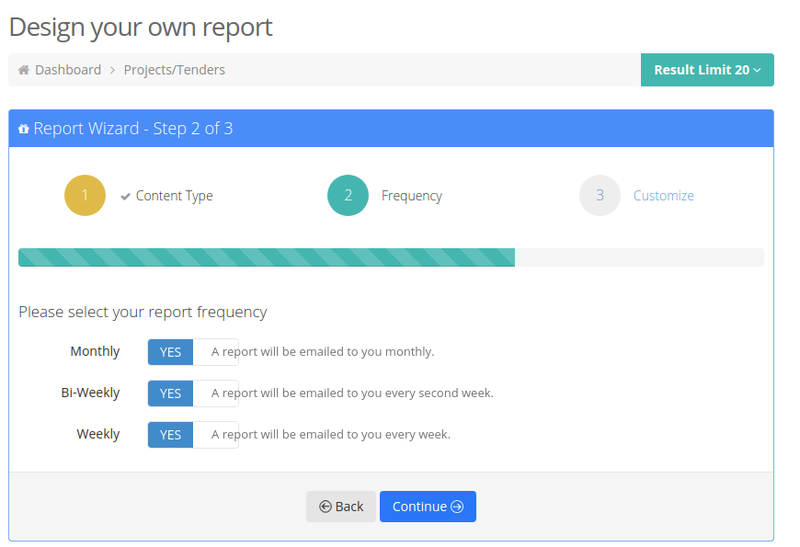 “Remove Leads” – Bulk removing Tenders/ Projects. 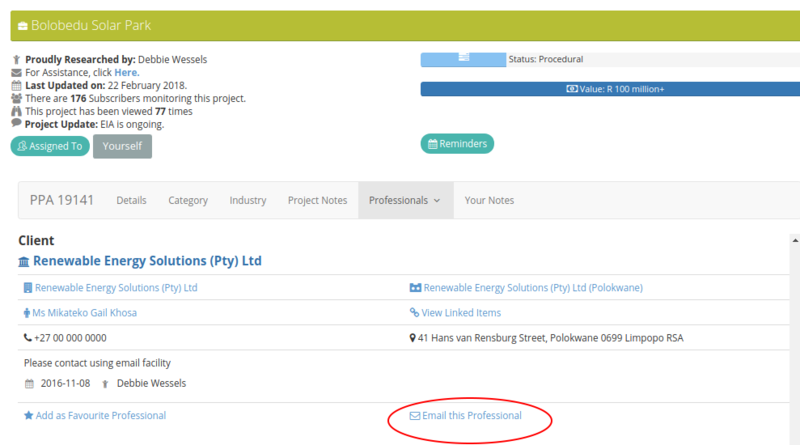 Select the option you would like (Tenders/ Projects) and click on “Remove”. “Replace this Monitor” – Overwrite a monitor (with a monitor that is taking over their task to deal with tenders/ projects). This will move the monitored items over to the new monitor. Bare in mind the domain name must remain the same as the main user. “Transfer / Copy Leads” – Transfer or copy leads to another monitor. 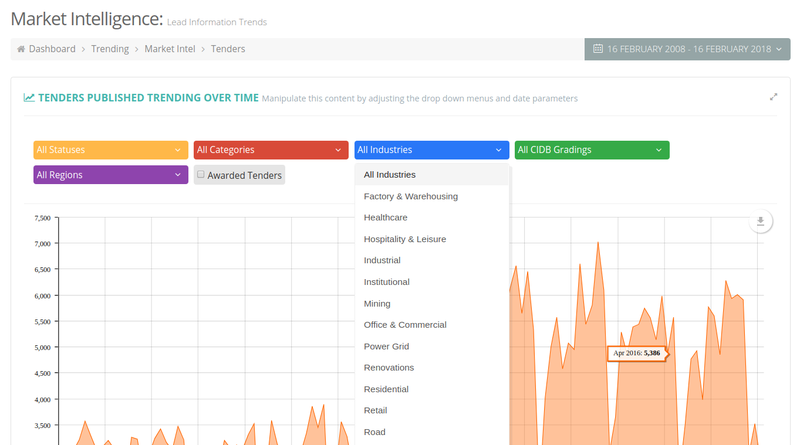 You can select the Tenders and/or Projects being monitored. You can select whether you want to “Transfer” or “Copy”. And then select to which existing monitor you wish to “Transfer” or “Copy” to. Select “Transfer”. When a monitor is created, they will receive an email with their own Username and Password. Each time a Tender or Project is assigned to a monitor, they get an email with a PDF copy of the tender/ project they have been assigned. 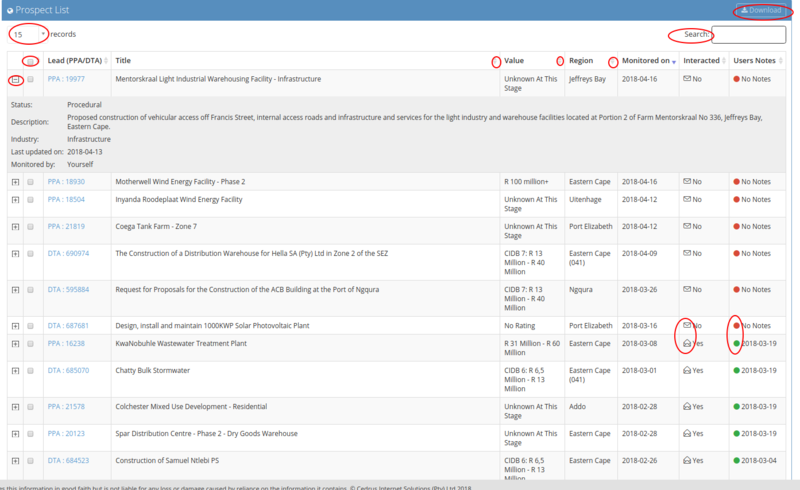 Monitors only have full access to the tenders/ projects that they have been assigned. 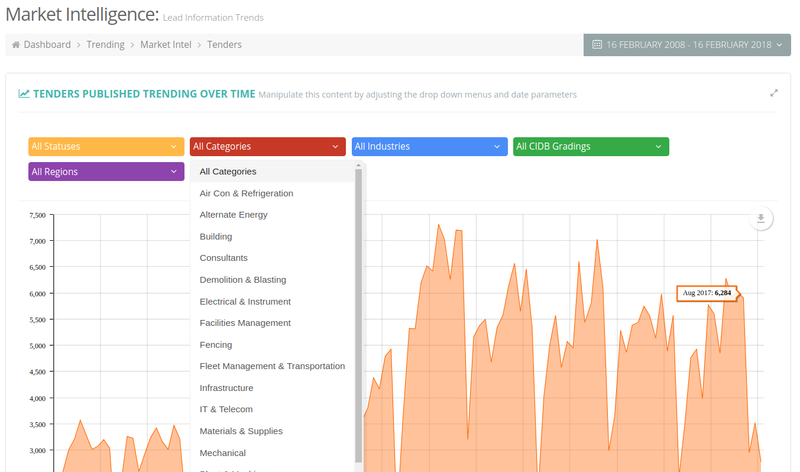 A Monitor is able to search for anything on our website, but will only be able to view Tenders/ Projects they are monitoring. 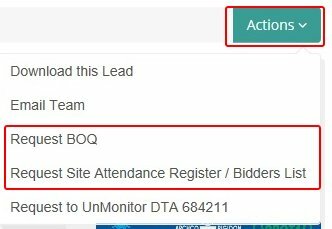 Should you find a tender or project that you are wanting to view, on the tender view page, under “Actions” click on “Add Request to Monitor DTA…”. The request will be sent to the main user, for approval. 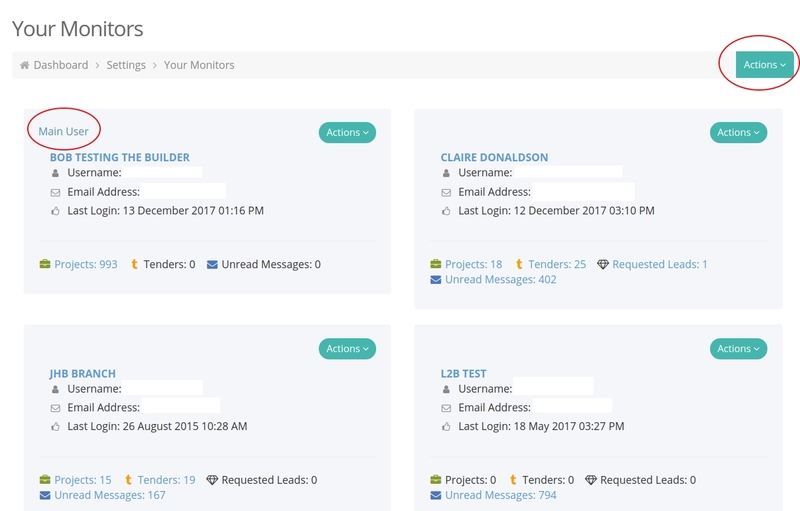 Monitors on tenders or projects, get Update emails as the Tender/ Project progresses (If documents are added, or details are changed, or it gets awarded, etc. ). 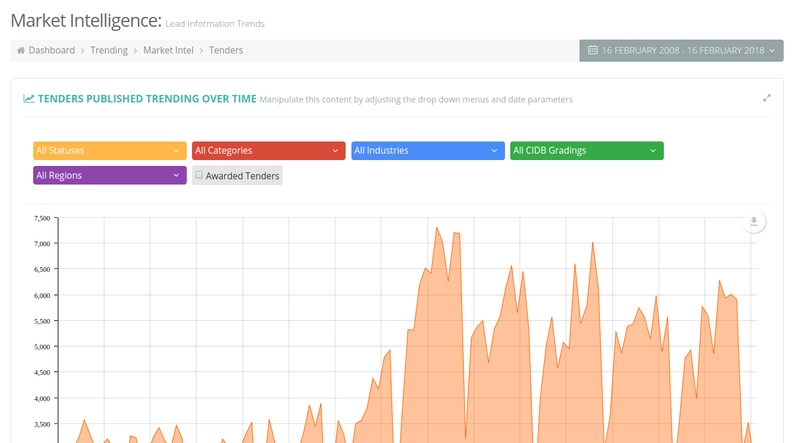 Monitors can request Award details on Closed Tender, that they are monitoring. 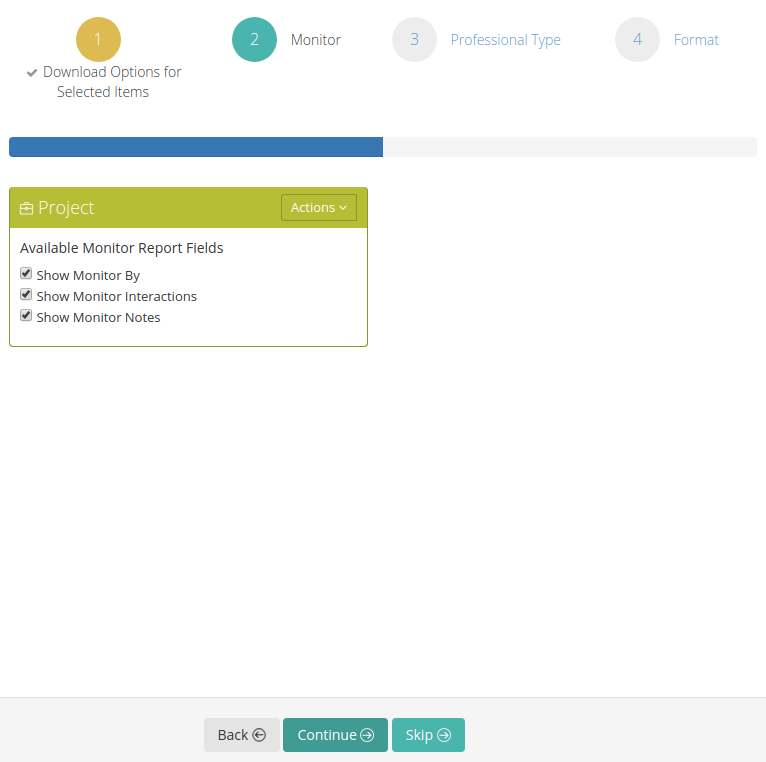 Monitors can also Directly contact the Researcher on tenders/ projects they are monitoring. Monitors cannot request Site Attendance Registers/ Bidders List or Bill of Quantities, on Tenders that they are not monitoring. 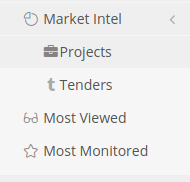 However, Monitors can see documents already attached to the Tender / Project. Under the “Actions” button at the top right of the page, you can also “Import Monitors”. This functionality will only be available to subscribers that have had access to our website prior to July 2016, who made use of the “Send Tender to Colleague” Functionality. This will give you a list of email addresses listed with the same domain name as the Main User, or those with a different domain name. You can select the email address that you want to import, and select “Import Selected”. Or if it is a monitor with a different domain “Send Import Request”, the request will be sent to the Account Executive, for consideration. Please bare in mind the limit of 5 monitors. Here you can see all the details as well as the contacts, seen above on the bottom left. You can go to the “Vendor” Home Page by clicking on either options below. 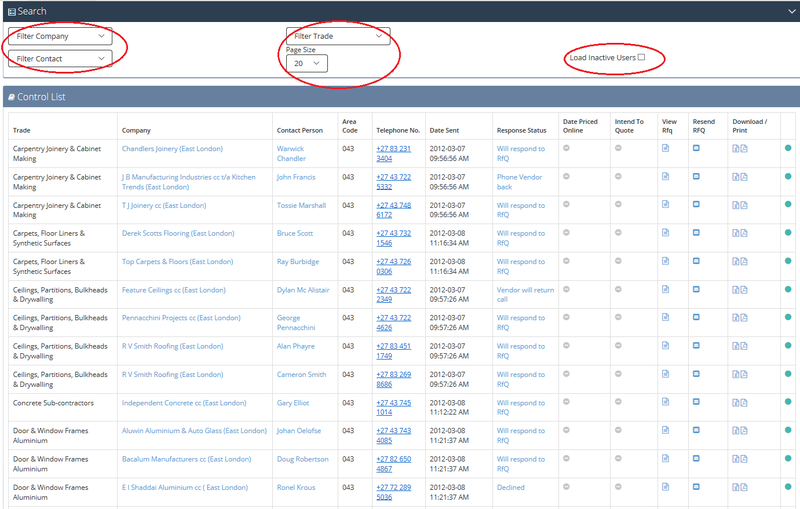 The “Vendor” Homepage is where the “Vendor” can view Request for Quotes (RFQ’s) that were sent via the Leads 2 Business platform by our Buyers. Your advisory filters are the key to receiving the relevant information from Leads 2 Business on a daily basis. The Daily Advisory is sent via e-mail in the afternoon and contains a summary of all the new projects and tenders published for the day according to how your filters are set up. 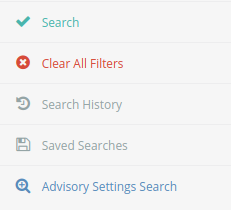 You will be directed to your advisory settings where you can set your Advisory Filter criteria. 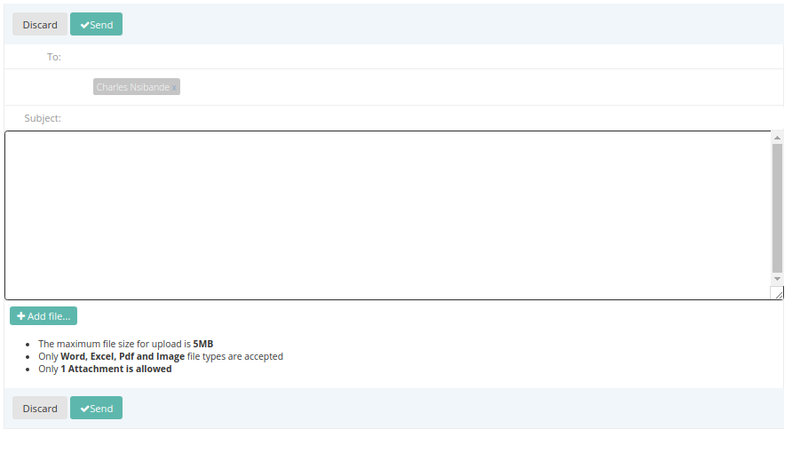 side of your email address, then select actions and select ‘Resend Confirmation Email’. 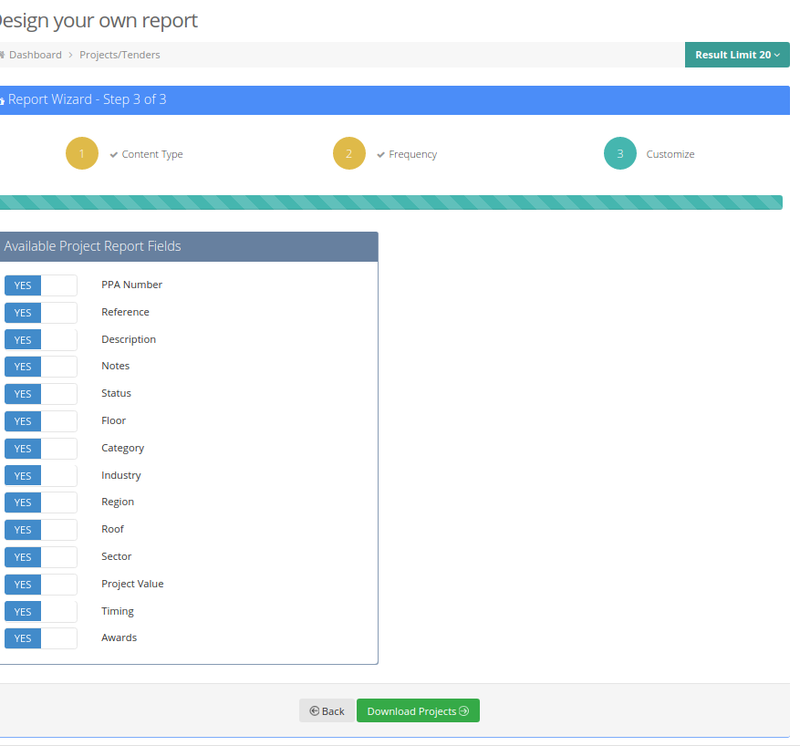 Project Information – Conceptual to Complete’ selected in order to receive information on Projects published. Refine your search results by using Keywords ‘ will allow you to select your own specific keywords, i.e. CCTV, Grass Cutting, Office Furniture etc. 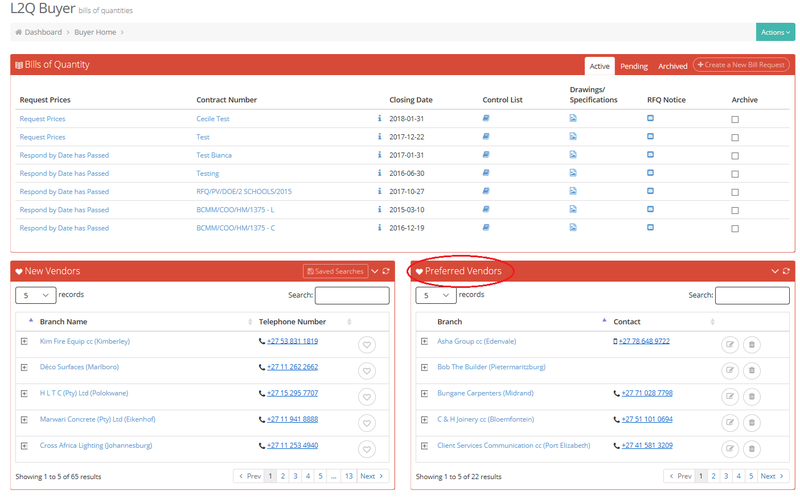 Our server searches which tenders have your keywords in them and will send these to you in the Keyword Advisory on you Daily Advisory. Once you have selected from this list, click on continue at the bottom of the page. Conceptual: This is the beginning phase of the Project. The Developers will be securing funding and feasibility. 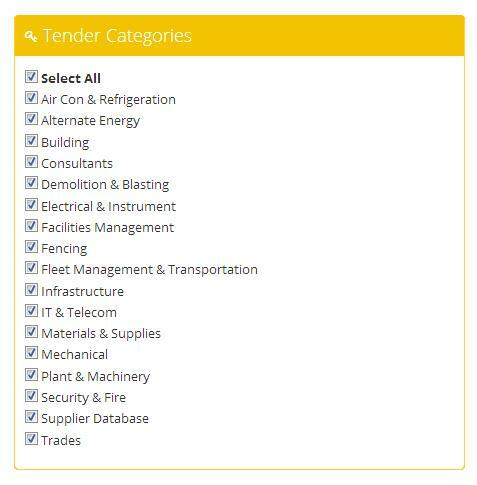 Tender: The Project is out to tender to main contractors. 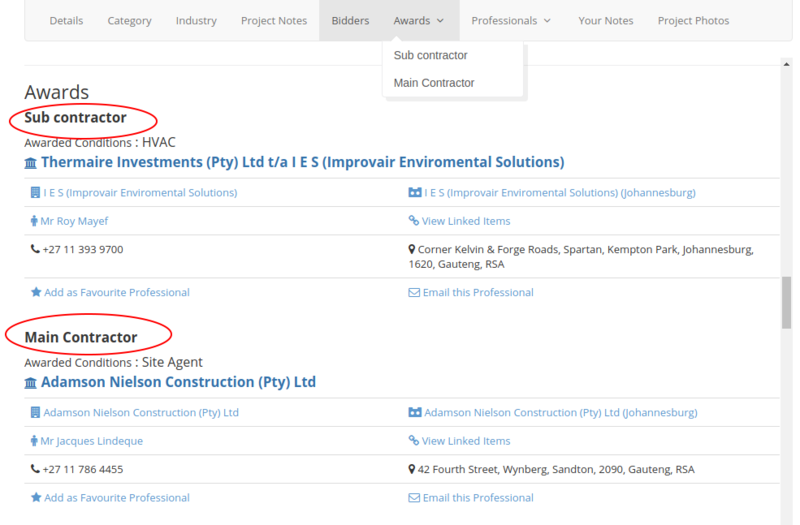 Bidding main contractors using our site to obtain pricing from sub-contractors and suppliers will be listed under the Bidders tab. 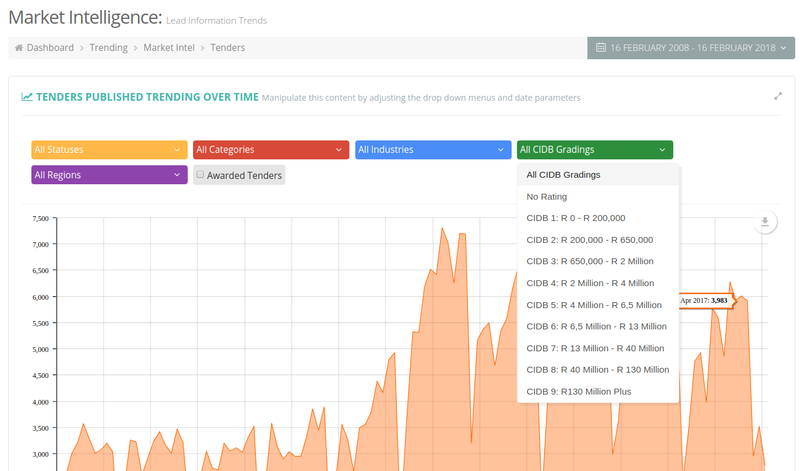 Select the relevant CIDB Gradings for your company as well as the relevant Project Values. 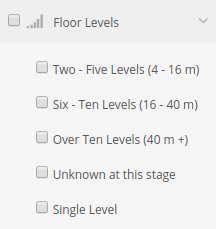 These values are the amount for the construction of the entire project. 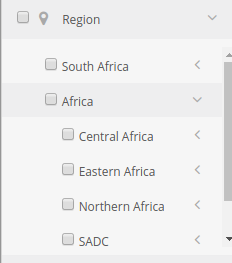 Select which regions you want to receive information for. 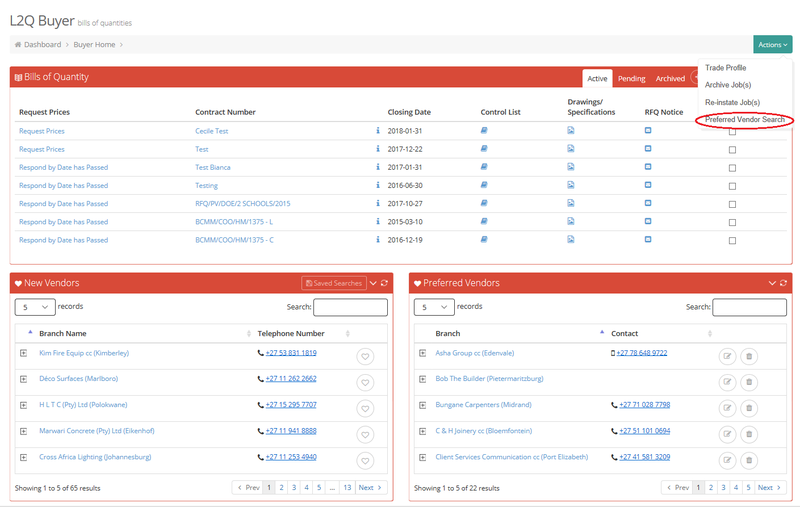 Our server searches for your keywords within the tenders that are published each day, and the relevant tenders are then included in your email under the ‘Keyword Advisory’. 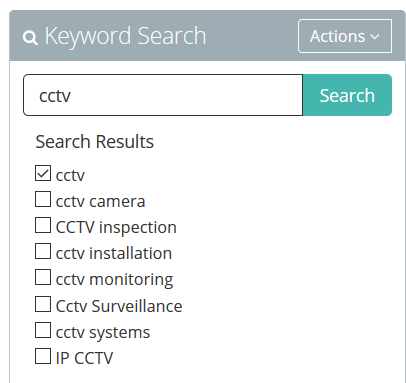 Here you are able to search your keyword and select ‘Search’, a list of all of our keywords which include your word will be displayed. Select which words you would like to add to your selection and then click on ‘Actions’ and select ‘Add Keyword’. This will add the selected keywords to your list of keywords in the block on the right side of your screen. 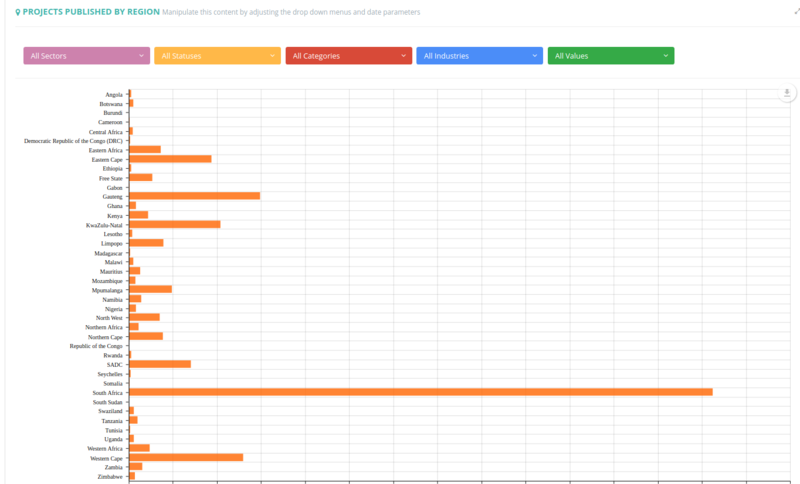 If you would like to choose keywords from our list of keywords, you will use the middle block. By clicking on a letter on the side in blue, this will take you to all the keywords that we have listed starting with that letter. 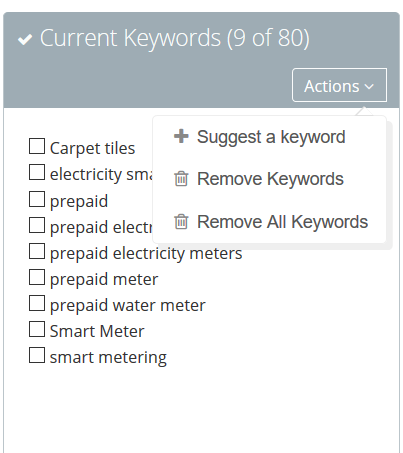 You can then select the keywords that are relevant, then click on the ‘Actions’ option at the top of the same block, and select ‘Add Keyword’. 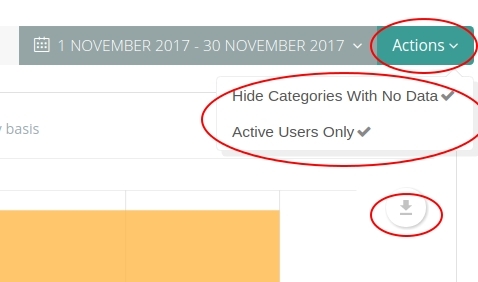 If you would like to remove or suggest a new keyword you will select the ‘Actions’ option at the top the block on the right side of your screen. 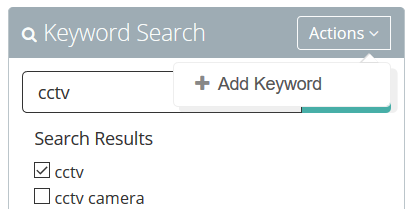 Once you are happy with your keywords, select continue at the bottom of the page. Send me all award information regardless of my filters – This will forward all tender award information that we publish. 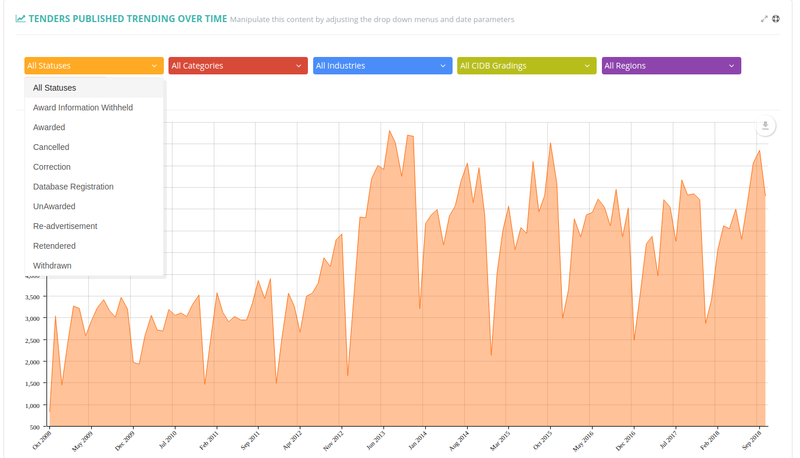 Send the previous advisories – If selected, this will email you the previous days Daily Advisory to show what was published according to your filters that you have just updated. Dismiss Lead Clicking on dismiss lead will remove the Project from your search page / search criteria. To re-access the lead please follow instructions on retrieving the Project via the Ignore Tag. Assistance “here” is a hyperlink to your email account and you have the facility to email the relevant researcher on the Project Lead should you have a query or require additional information. Your appointed Account Executive is cc’ed in the email. 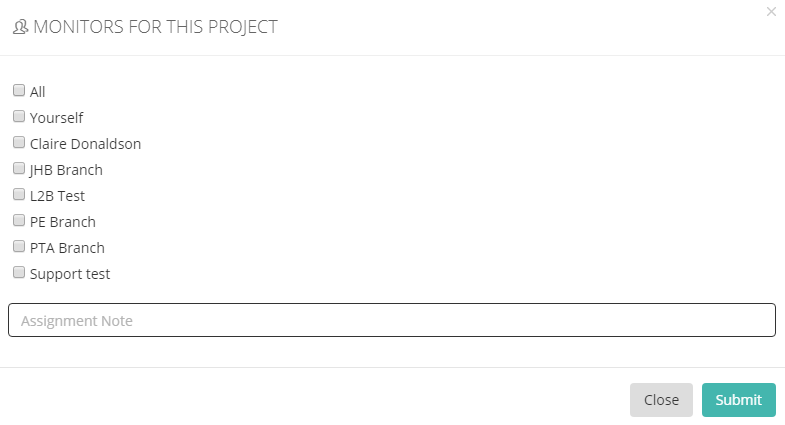 The subject line will indicate the reference number of the Project Lead. The researcher will respond by return email. 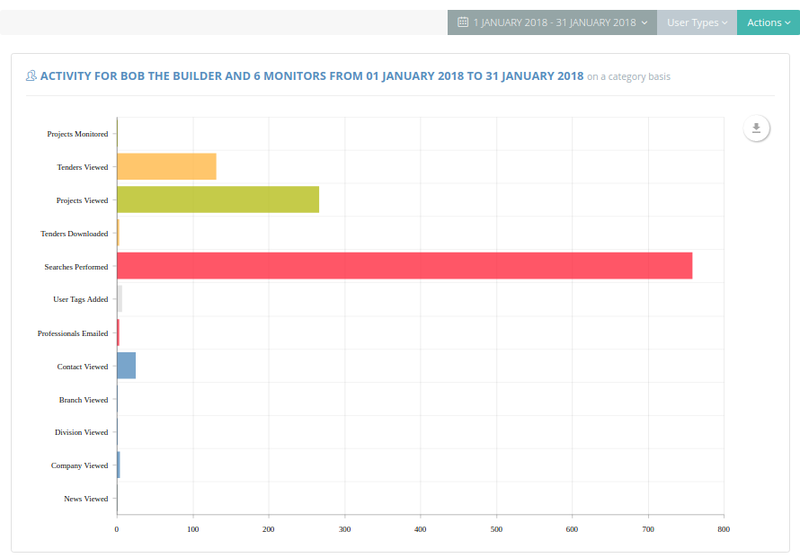 Number of monitors This indicates the number of subscribers that would like to be kept up to date on the Project Lead and have elected to monitor the Project Lead in order to receive the update emails as they are generated. Project Update All monitors will be advised by email when the Project Lead has been updated. 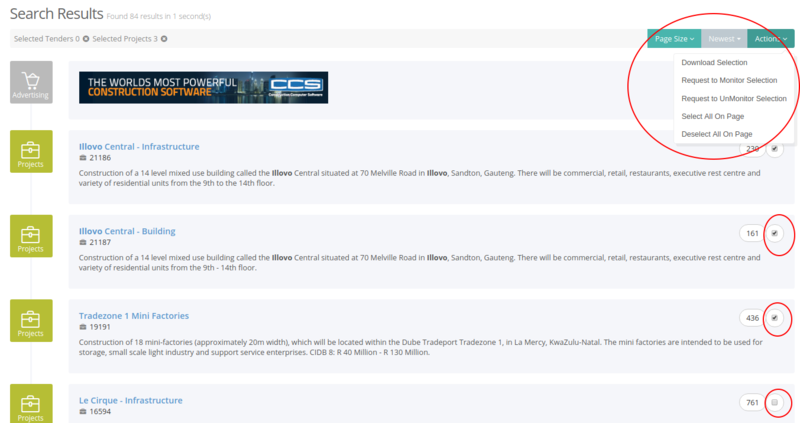 For your convenience, it is indicated in the Project Update what has been updated. Project Reference number A unique number is allocated to the Project Lead when it is uploaded onto the site. Industry Industry that the Project Lead is linked to. 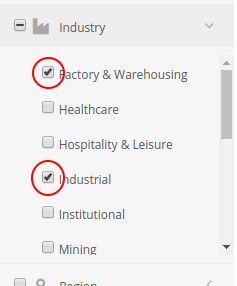 If it is a multistory building with various Industries, they will all be listed. Project Photos These Project Photos pertain to that specific Project, if there is more than one photo available you can click through using the arrow key or click on the specific photo to open it. 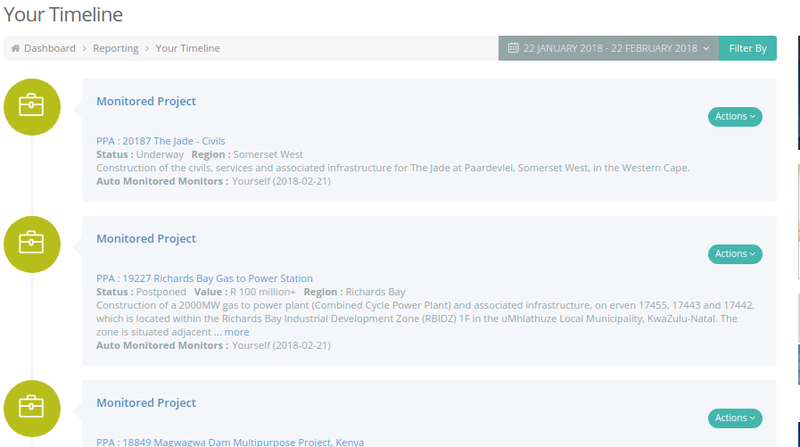 A Daily Advisory is an email sent every afternoon to let you know of all the Projects and/or Tenders published each day according to the filters that you have set up for your profile. If you are looking for assistance when you are online and logged into the website, listed under the Leads 2 Business logo on the home page, on the dropdown menu on the left hand side of your screen, scroll down and you will find Support. LiveHelp – This is our livechat facility that operates during office hours, Monday – Friday, 7.30am – 5.00pm. Here you can talk directly to an operator online and get an immediate response. Contact us – This gives you various ways of getting in touch with us in order to best assist you. Help – This is a on-line tutorial help facility, using pictures/videos to assist you. Library – This is where all the documents are stored – i.e. General Conditions of Contract etc. and you can download documents from the Library. FAQ – Frequently Asked Questions, which is explained above. 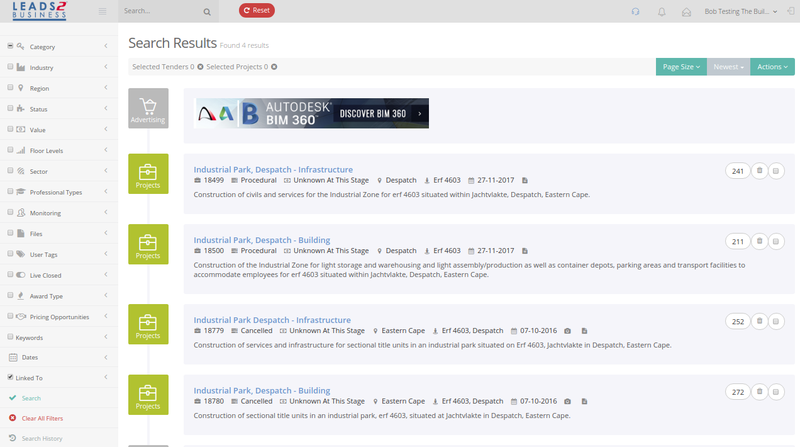 Your search result will list the Project Leads that meet your search criteria. Conceptual: These are Projects in the very early sensitive stages. An idea or concept that could potentially become a realisation. Feasibility Studies and Funding would be a priority during this stage. Procedural: This stage involves the securing of various applications, approvals and authorisations and could include the appointing of the professional team is not already appointed. The EIA details will not be available on the site as they are only involved in the environmental process and are not involved in the construction of the project or procurement. 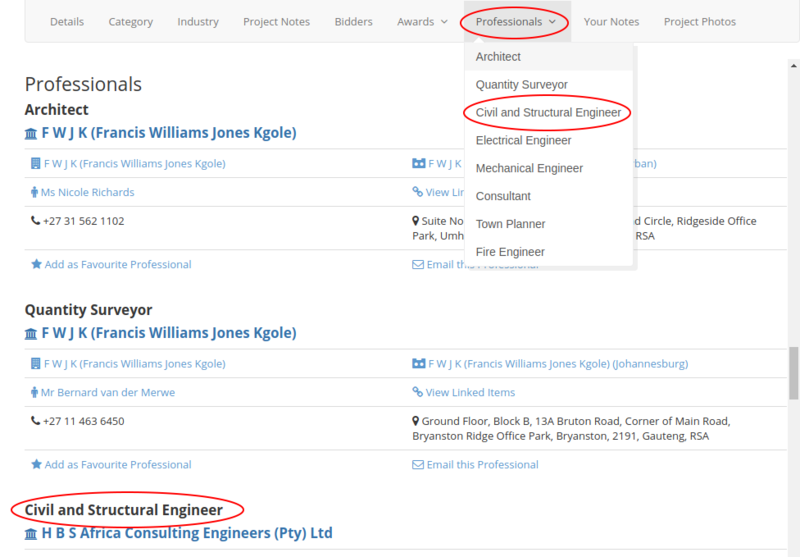 Design: The Project Lead moves into the Design Stage once an Architect (for buildings), Civil Engineer (for roads) and Structural Engineer (for bridges) has been appointed. 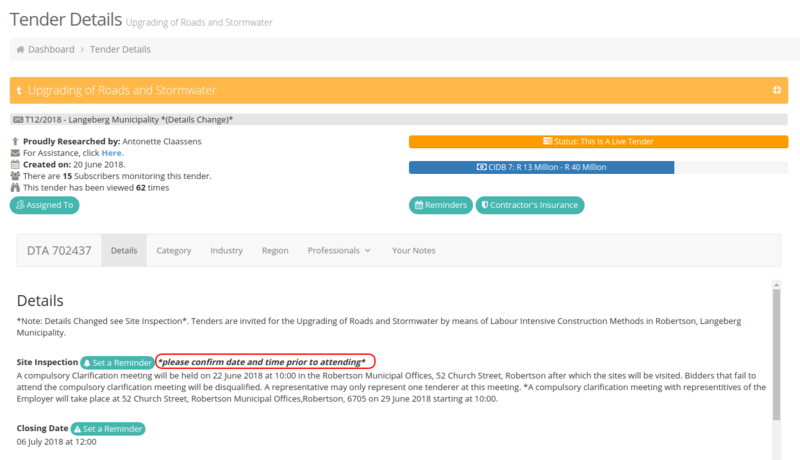 Tender: This indicates that a tender document has been published. This tender notice could be private & negotiated or public. The Project Lead remains in the status of Tender until the contract has been awarded. Awarded: This means the main contractor has been appointed. The contractor’s details will be listed under Awards. This status only remains in effect until site handover and construction has commenced. Underway: This indicates that construction has commenced. Cancelled: Cancelled Project Leads can occur due to lack of funding, Client confidentiality, no longer going ahead or lack of further information can be sourced. These can also be selected individually. 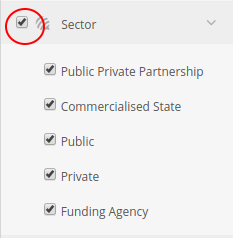 Selecting Sector will highlight all the sectors available. Commercialised State: The funding for the Project is supplied by a commercialised Government entity e.g. Denel, Eskom, Alexcor, Safcol, Transnet, SAA, NRA, PRASA and Coega. 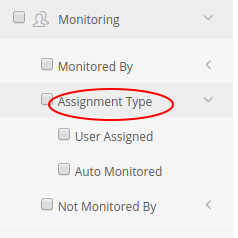 Assignment Type: This is how the Project Lead was assigned to be monitored. Alternatively you can select either Photos or documents to be populated in the search result. Projects has two award categories – Main Contractor and Subcontractors. Sub contractor – these are the contractors that have been appointed for sub contracting. 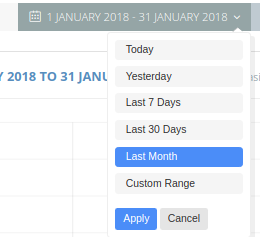 Dates: Select date period or double click on the single date required, click on apply to confirm the date selection. In the Library you can find General Conditions of Contract, Proformas and other forms. The documents are listed across the top in green tabs. Underneath the green tabs, the various documents are listed with a picture as indicated above. When you click on the green tab, Like for instance the All tab, once clicked,the tab will turn from green into grey and all the documents available in the library will be displayed with pictures underneath and the titles of the documents are listed under the pictures. 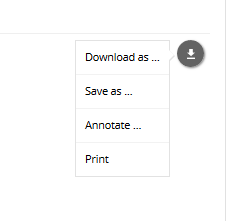 When you put your mouse on the picture of the document you are interested in, the picture will move up and a green download button will appear, giving you the option to download the document to your computer and from there you can print it. Click on the green download button to download the document. Once you click on the Help, the following screen will open, as shown below. can click on the relevant green tab and a screenshot will appear showing you what to look for on the website. If you are looking for some support on the website and/or wanting to get in touch with Leads 2 Business, this is where you can find the support and help. Maybe you would like a Sales Executive to get hold of you, or maybe you have a question after working hours or over weekends when the LiveHelp facility is not operational, then you can use this facility to get in touch with us and we will respond during working hours, Monday to Friday. Once you click on the Contact Us Icon, you will have the following options available: Feedback OR Request an Appointment. 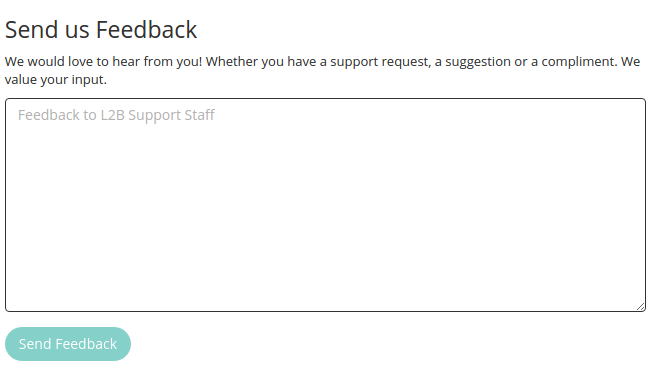 On this page, you can either send us Feedback, using the following box. You will type your request, suggestion or compliment into the box provided and when finished, hit the Green Send Feedback button and the feedback will be sent directly through to us and we will respond to you shortly. 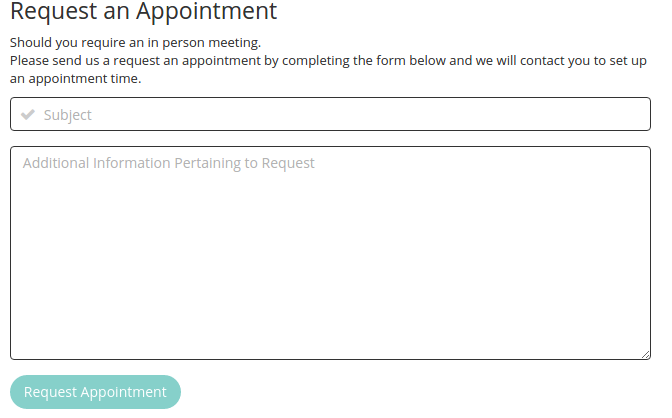 Or, alternatively also on this page, directly underneath the Feedback box, also on the right hand side of your screen is the option to Request an Appointment. If you would like a Sales Executive to come out and see you, you can complete this box, requesting an appointment. 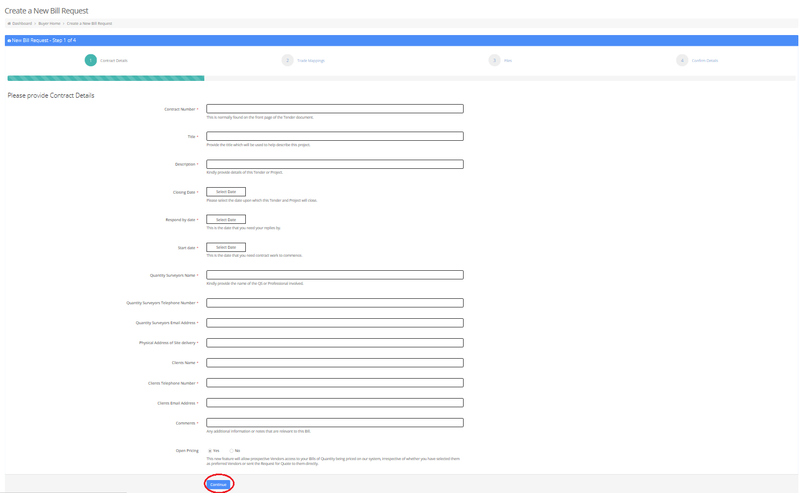 In the top box, you can just fill in a short subject line and in the second box underneath, if you have any additional information pertaining to your request, you can fill it in here. Once you have finished typing in your request, you can click on the green Request Appointment button at the bottom and it will send the request directly to us and someone from Leads 2 Business will give you a call to set up an appointment time. 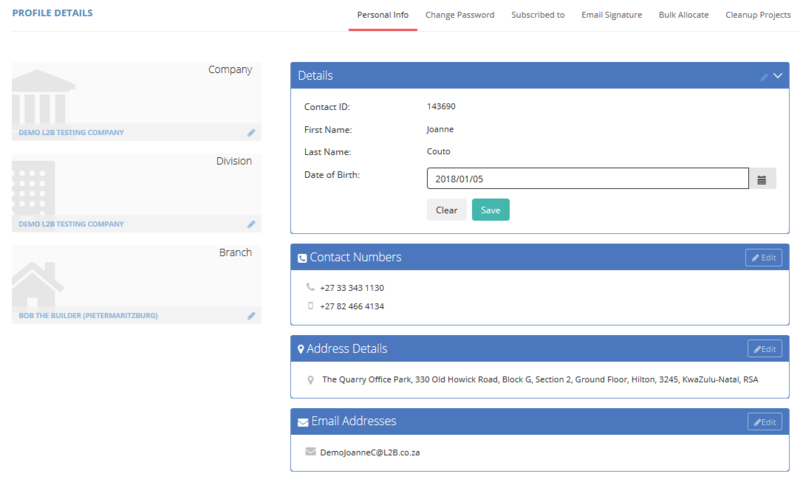 You can view and edit your Personal Info, Change Password, View what you are Subscribed to, Email Signature (add your signature with your company logo), Bulk Allocate and Cleanup Projects. 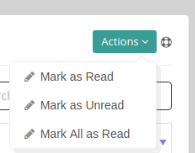 Click on “Resend Advisories” and you will be able to resend your previous advisories. Advisory being the e-mail you receive on a daily basis with a summary of all the tenders and projects for that particular day. The blue block indicates the date you would like to receive the advisories. 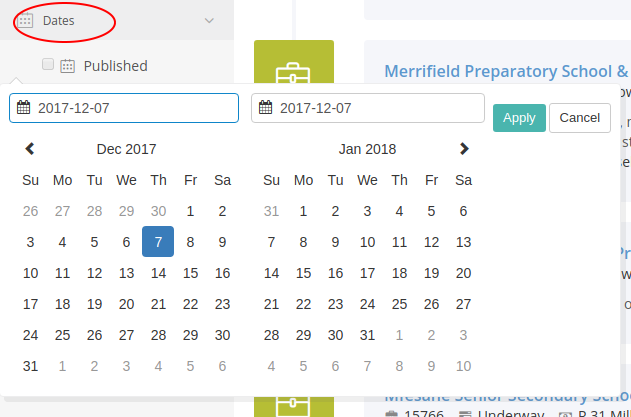 Select the advisory you would like to receive and select a date and select resend. You will then receive your advisories shortly. Your Advisory is the e-mail you receive on a daily basis with a summary of all the leads for that particular day that are of interest to you. Your Advisory Settings are very important as if you have incorrect settings you can miss out on Leads. In order to edit your settings, you need to select “Advisory Settings” (You can also view your “Advisory Settings” by going to “Settings” and select “Advisory Settings”). You will then come through to the Advisory Settings Wizard. 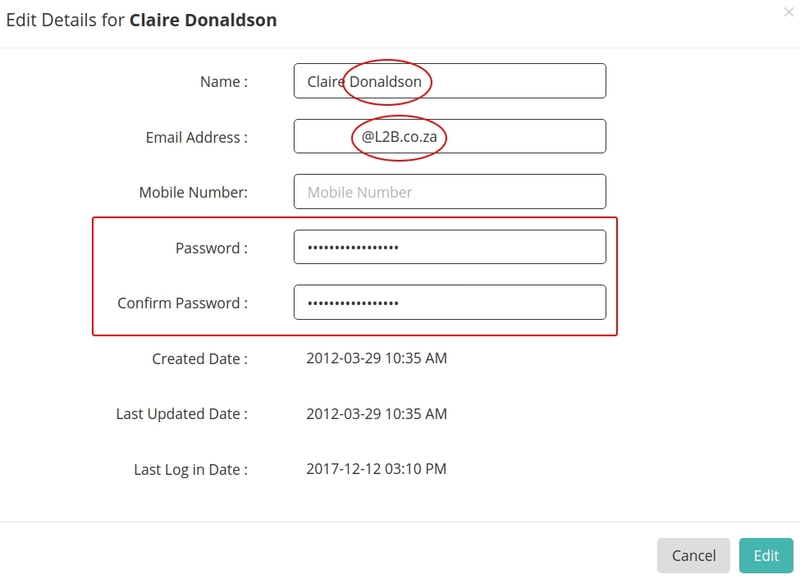 If you click the drop down arrow next to your Login Name the following selection will appear: Advisory Settings http://wiki.l2b.co.za/advisory-settings/ Resend Advisories http://wiki.l2b.co.za/resend-advisories/, Profile Settings http://wiki.l2b.co.za/profile-settings/, Calendar http://wiki.l2b.co.za/calender/ and Inbox http://wiki.l2b.co.za/messaging/. You can either click on the envelope next to your name, or click on the drop down arrow next to your name and select “Inbox” or you can click on “Inbox” to view sent and received e-mails (Emails that were sent via the L2B platform). The e-mails address needs to be on our Directory before you can send the e-mail so therefore the e-mails listed here will either to/from for Monitors (if you have requested a Monitor to Monitor a project or tender), Professionals on our Directory and if there have been any updates on RFQ’s that you have been sent. If you require assistance you can speak to one of our friendly and helpful staff members by simply clicking on the Earphones logo (or go to “Support” and click on “Live Help”) and you will be responded to almost immediately, during working hours from 07:30 to 17:00 Monday to Friday. “Reset” clears your search results. 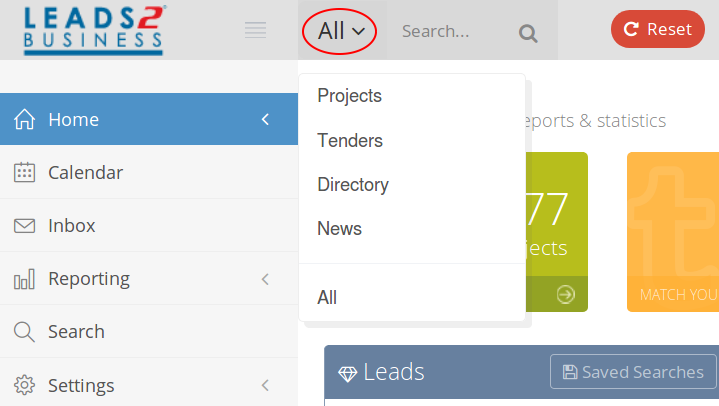 Click on the drop down arrow next to “All” and you can search the system for all Projects, Tenders, Directory, News and All (all of the above) on the system at the same time or you can minimize your search and select each category individually and select search. 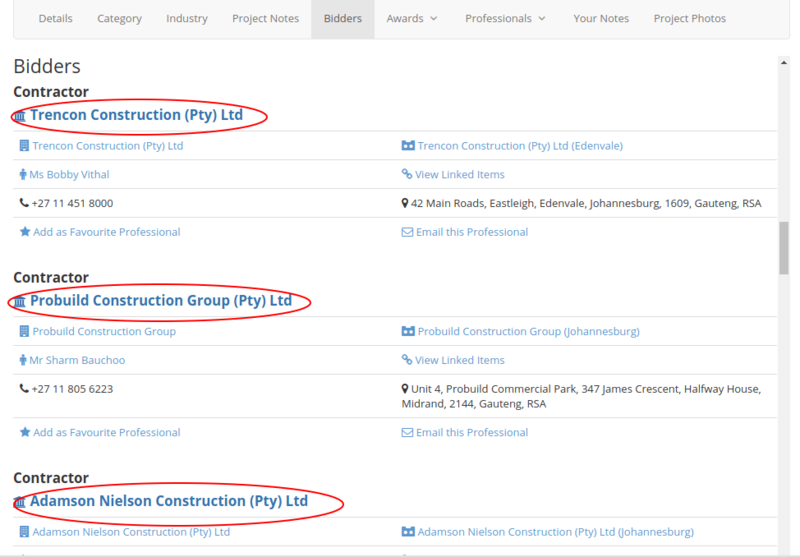 For Example if you wish to search for Projects only, click on “Projects” and in the “Search” block type in a Keyword, eg: Name of a Project or part of the project name, PPA Number and Company Name etc. and then select search Icon. The same pertains to Tenders. For “Directory” search type in either the Company Name, Name of Person or e-mail address or contact number etc and then search icon. For “News” this is to search for the Daily News Letter which goes out everyday with the Daily Advisories if you select to receive the news letter. To hide the Toolbar and the L2B Logo, click on the 4 horizontal lines and to bring the toolbar back, click on the lines again. 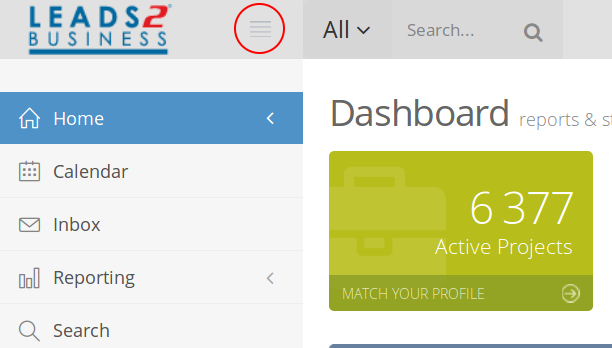 To return to the “Dashboard” click on the Leads 2 Business Logo. 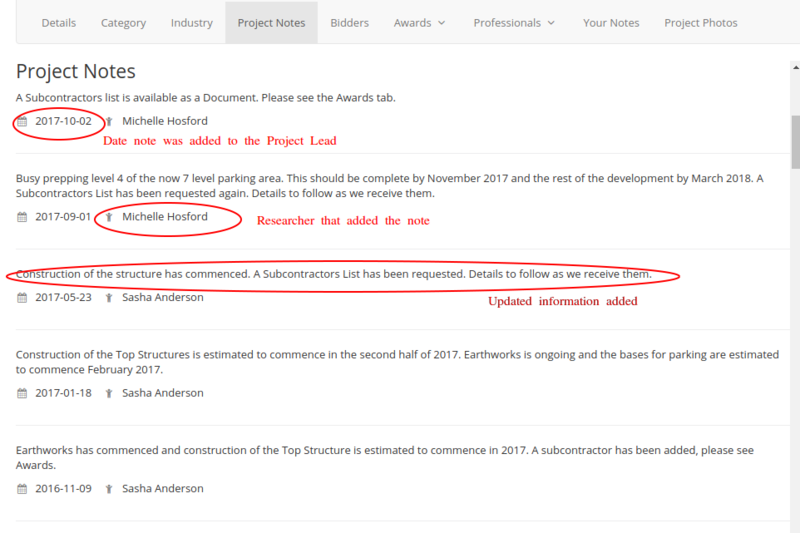 Your Notes – This allows you to add your own notes to a tender notice. Tender Award – This will show the Date of the Award and the Awarded Value (if known). This section will also show the L2B Researcher who followed up on the award information. The Researcher’s name will be a link, allowing them to be contacted concerning the Award. Tender Award Notes – These notes will indicate the latest information concerning the award and will be dated, and show the applicable L2B Researcher. 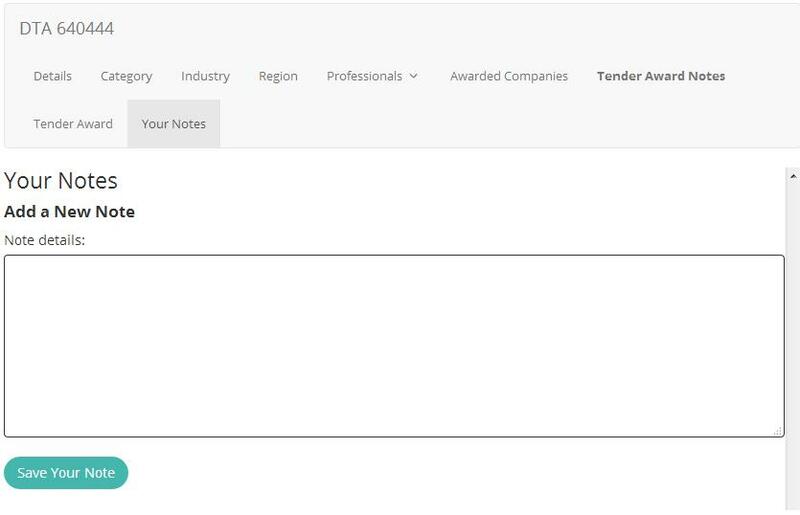 Awarded Companies – If a tender has been successfully awarded to a company or companies, this section will display the Awarded Companies details. Contact Details – This is the contact details for the awarded company. 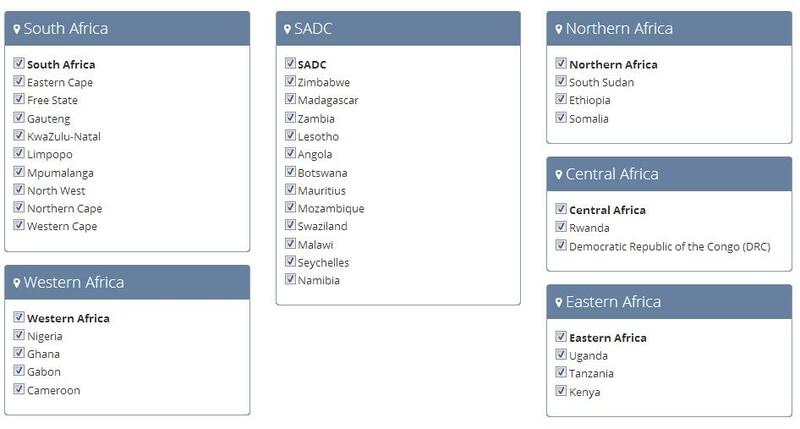 Region – Leads 2 Business researches tender notices throughout South Africa and a number of countries in Africa. Depending on the details supplied in a tender, the Region could either be a Country, a Province, a Provincial Dialing Code area or a City. Protip: If a tender has a Region as a City (e.g. 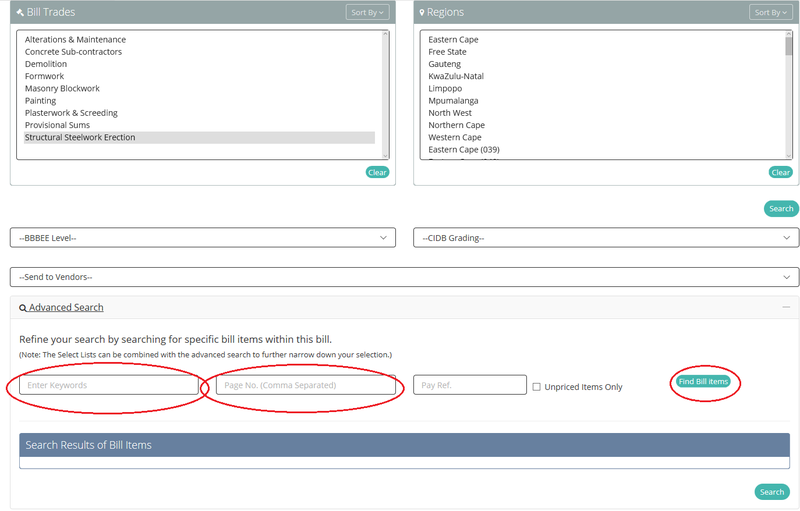 Durban), a subscriber will receive that tender as along as they have the applicable Province/ Country (e.g. Kwazulu-Natal) selected (and other applicable criteria). Industry – This indicates in which sector the work is taking place. The Industries are: Factory & Warehousing; Healthcare; Hospitality & Leisure; Industrial; Institutional; Mining; Office & Commercial; Power Grid; Renovations; Residential; Retail; Road; Transport Terminal; Water. 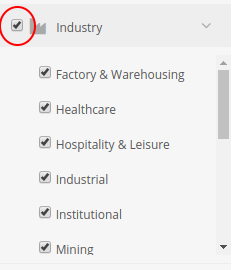 Protip: Unless there’s a particular Industry you are not interested, select all the Industries. Category – This indicates the work required for the tender notice. What is mentioned in the Description is used to categorise the tender. 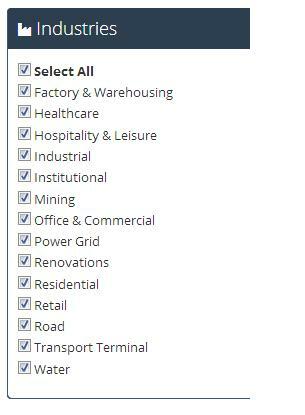 The Categories are: Air Con & Refrigeration; Alternate Energy; Building; Consultants; Demolition & Blasting; Electrical & Instrument; Facilities Management; Fencing; Fleet Management & Transportation; Infrastructure; IT & Telecom; Materials & Supplies; Mechanical; Plant & machinery; Security & Fire; Supplier Database; Trades. Protip: Always ensure that your Advisory settings are set up correctly, to ensure you are notified of tenders that are beneficial to your company. Language – All tender notices on Leads 2 Business are available in English, however some have to be translated first. This field will indicate if it’s a translated tender or not. Validity Period – This will indicate the expected period of time that the prices submitted on the closing date, must be valid for. Examples: 30 days, 60 days or 90 days from closing date and time. Financing Institution – This will indicate the Financing Institution for the tender. In other words, the source of funding for the contract. This is more applicable for tenders in Africa. Contract Details – This is the Contract period. This is the expected length of the contract. Delivery Point – This is where the tender documents, and applicable supporting documentation, must be submitted on the Closing Date. Deposit Details – This field will either display the amount payable for the tender documents, reference the Document Collection field for the various options in obtaining the tender documents or it will state “No Details”. Document Collection Service – This service is only available for Gauteng tenders. Whereby a subscriber can request for the Documents to be collected on their behalf for a fee. Document Collection – This field concerns whether there are tender documents available, from where they are available and from when. 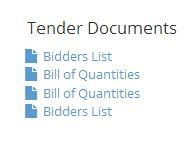 This field can also contain options available for purchasing/ collecting the tender documents. 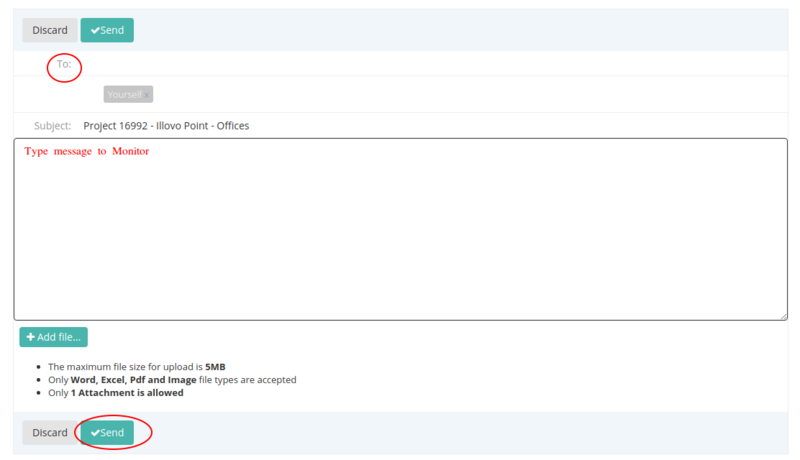 Protip: If there’s no Document Collection field; please check that you have logged in successfully. Certain information is withheld under certain circumstances. Closing Date Reminder – When the Closing Date is still pending, there’s an option to Set a Reminder. Once the Closing Date has passed, this specific reminder option is no longer available. Closing Date – This is the date and time that the tender documents must be handed in at the Delivery Point. Request Attendance Service – This service is only available for Gauteng tenders. Whereby a subscriber can request for the site meeting to be attended on their behalf for a fee. Once the meeting date passes, this specific reminder option is no longer available. Site Inspection information – Also known as a briefing meeting, clarification meeting, information session etc. If a meeting is scheduled, then it will be specified whether it is compulsory or not, the date and time and venue as well as any other criteria required for the meeting. If there’s no meeting scheduled, it will state that there’s no meeting scheduled. If the tender notice hasn’t mentioned anything concerning a meeting, it will state “No Details”. Description – This is the breakdown (whether general or specific) of the services or goods or works requested/ required in the tender notice. Protip: If the full Description is not displaying, then you are not logged into the website. Title – A brief summary of the Description, The Title is what appears in the Advisory email sent to subscribers each day. DTA (Daily Tender Advisory) Number – This is the unique reference given to the tender notice by L2B. It is the quickest and most efficient number to use to find the specific tender you are looking for. It is readily available on from the Advisory email, and ideally should be referenced in all correspondence with L2B. 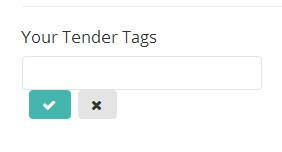 Your Tender Tags – Allows the subscriber to create and tag a tender for quick searching, filtering and organisation. To add a Tag, click on the Tags button and a field will appear. Type the name of your Tag and then click the Tick button. To remove the Tag, click the Cross. 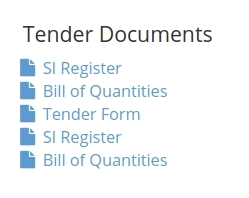 Tender Documents – If there are any documents already available on the tender notice, namely Bill of Quantity (BoQ), Site Attendance Register (SI register), Tender Application Forms or Bidders Lists; they will appear on the right hand side of the tender notice; listed under Tender Documents.